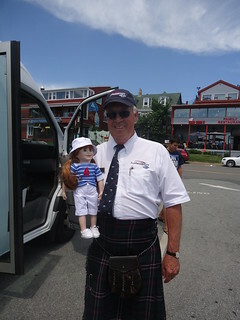 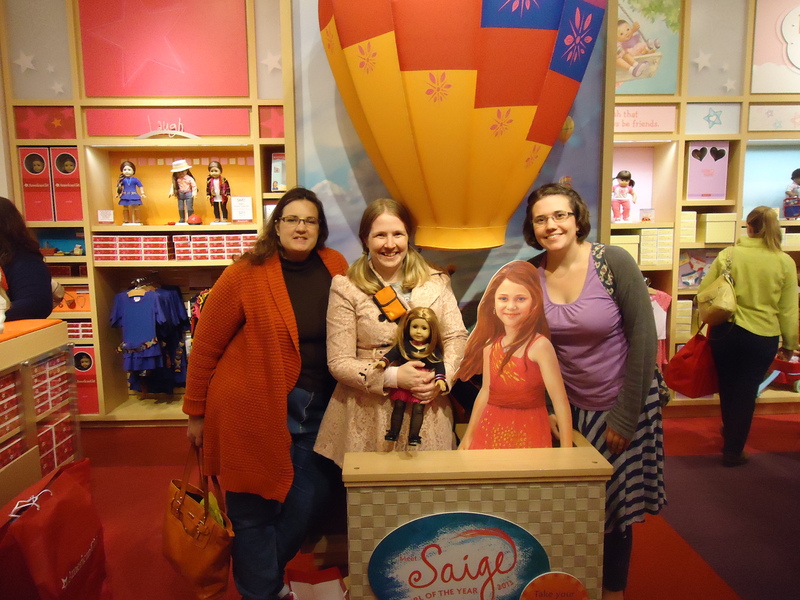 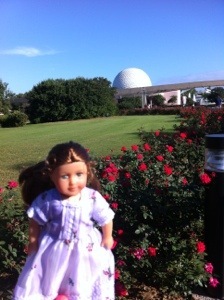 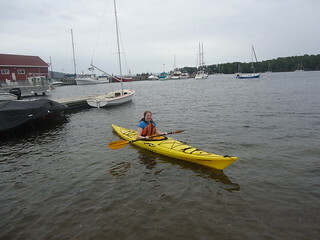 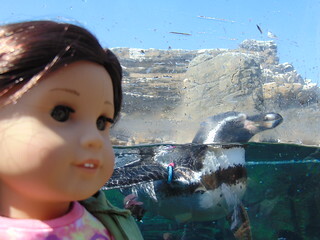 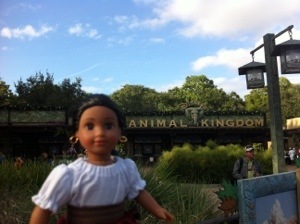 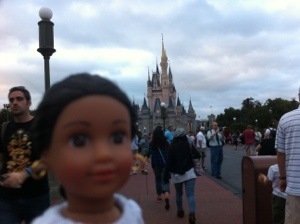 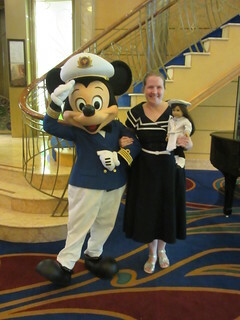 This time next week I will be on my way to American Girl! 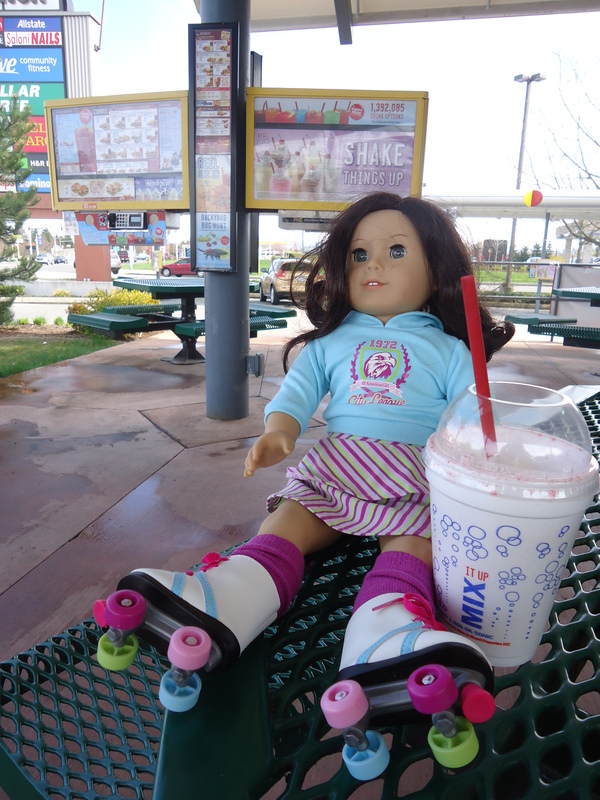 celebrating today is Mia, girl of the year 2008. 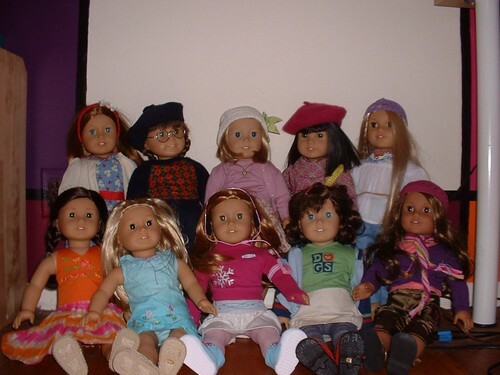 And how ’bout a group photo from when Mia first arrived? 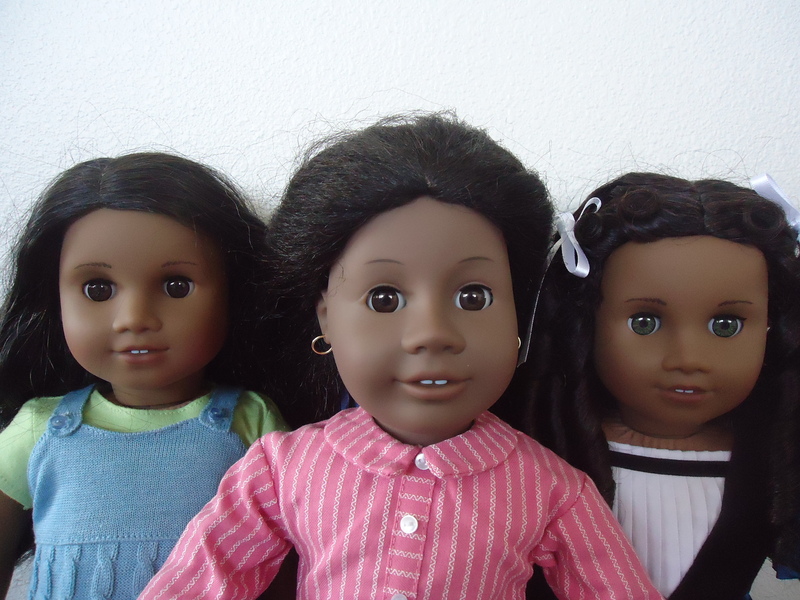 I got Mia, Julie, and Ivy all at the same time when I arrived home from school on winter break in January 2008. 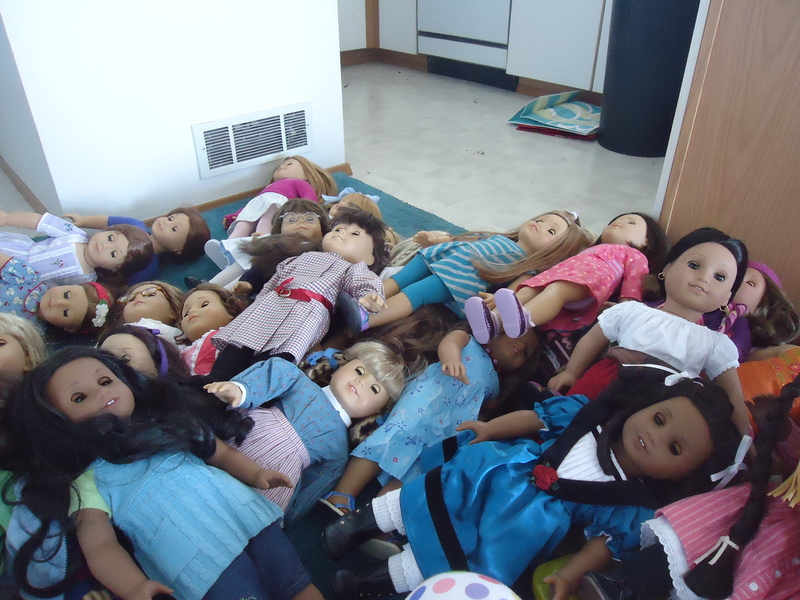 Nicki is absent from this photo, she was holding down the fort at school. 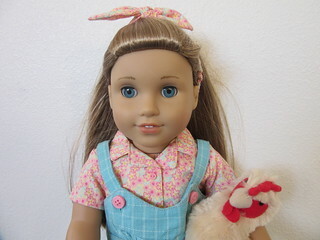 PS: I updated my AG wish list because I got a few items for Christmas! 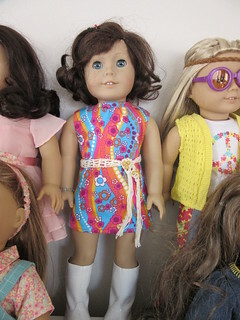 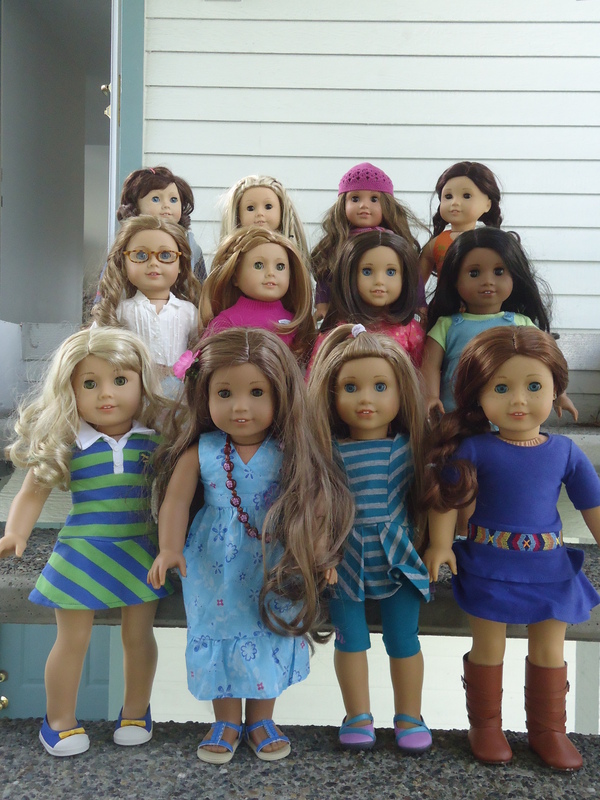 When people find out I have 30 American Girl dolls, they sometimes ask, “Don’t they all look the same?” Or, when I get excited about a new doll, my sister has asked, “Don’t you already have a doll that looks like that?” The answer to both of those questions is no, and this post is going to explore that. 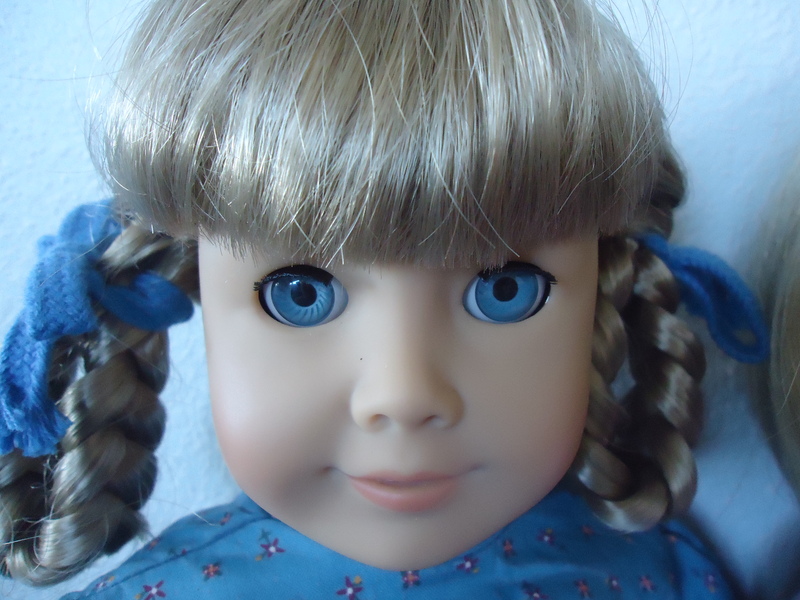 Please prepare yourself for a page full of dolly mugshots. 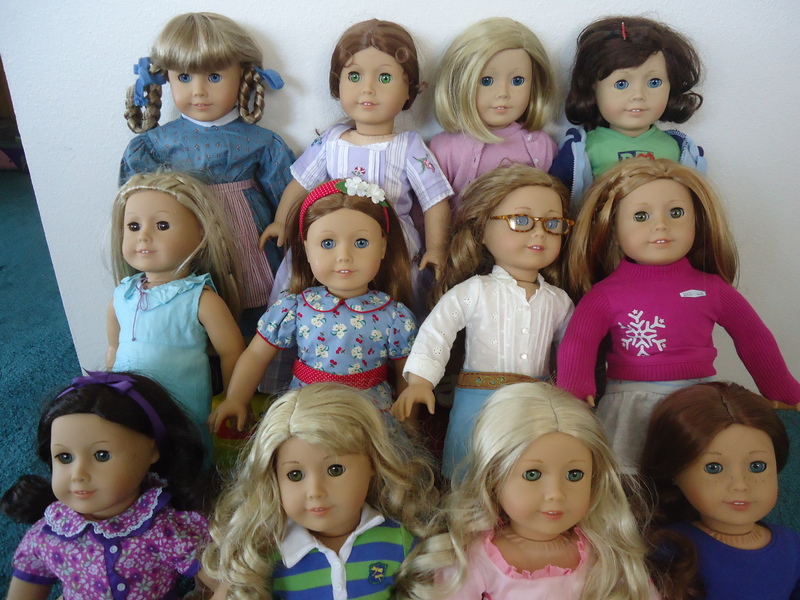 I also want to say that my comparison will neglect the Girl of Today/My AG/Just Like You dolls, because I don’t collect them. 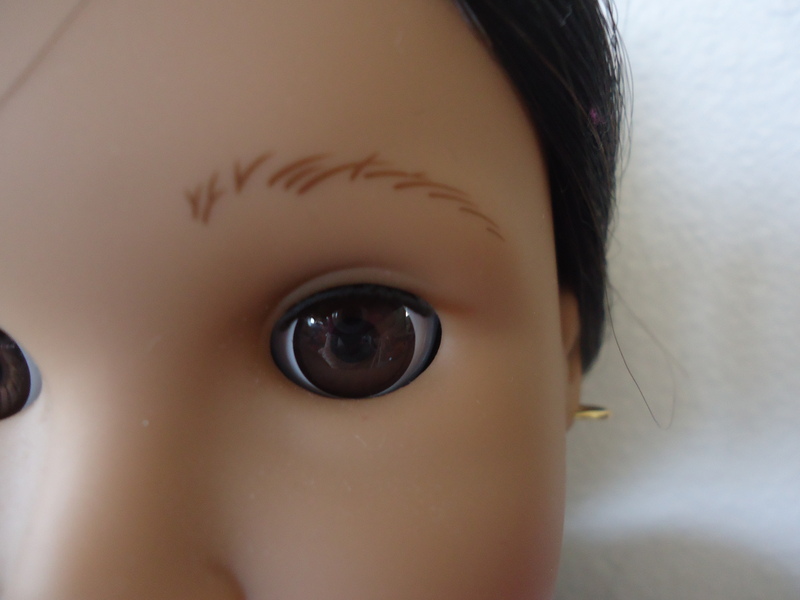 That line offers even more hair/face/eye combinations, none of which I feel need to be added to my collection. 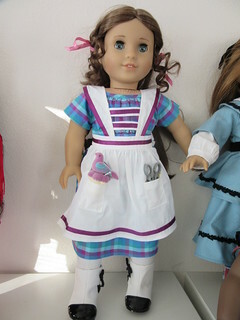 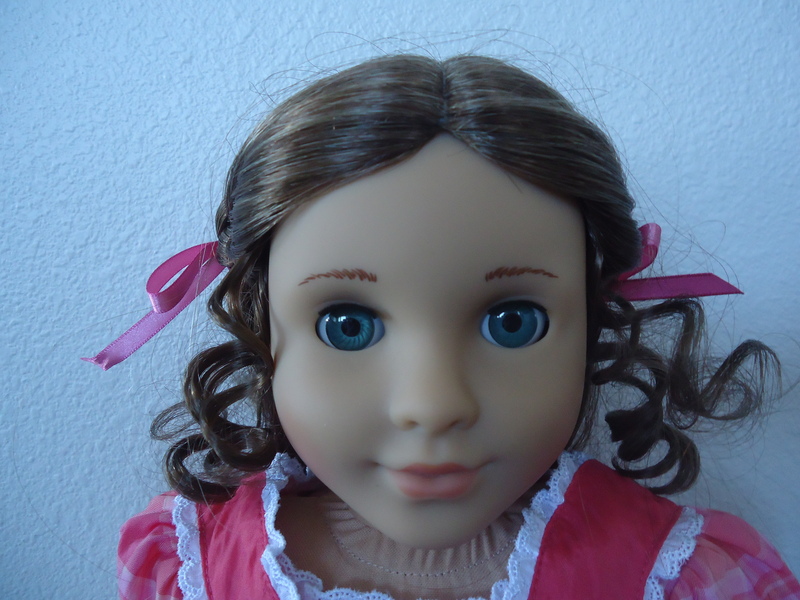 Let’s start with the biggest difference: there are dolls with different faces! 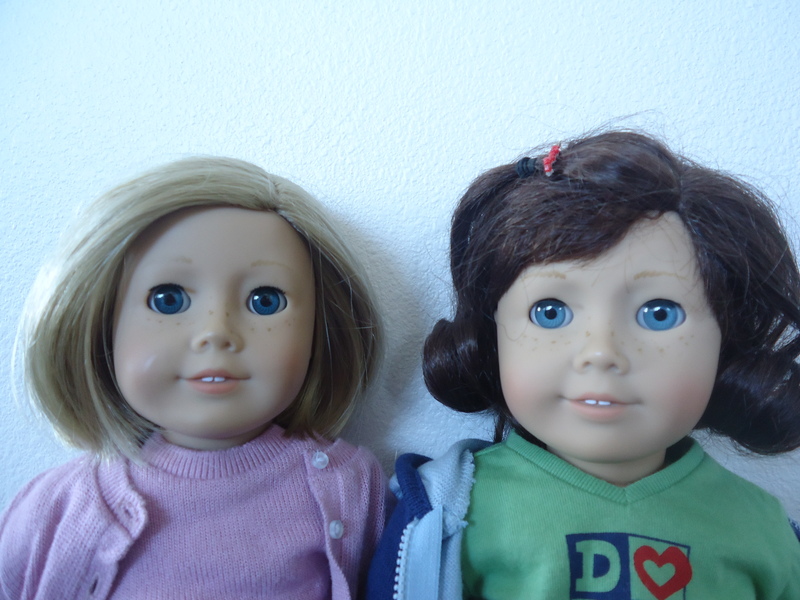 American Girl has used multiple face molds through the years. 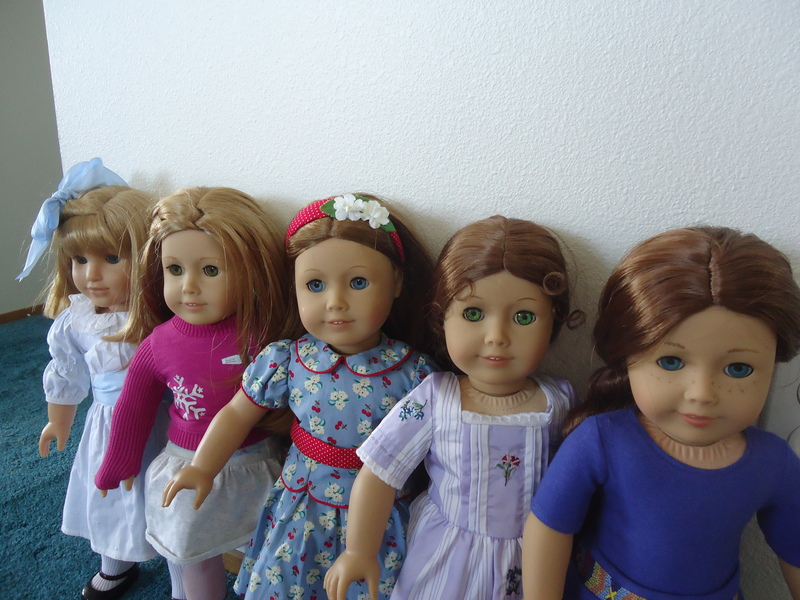 Let’s go through them. 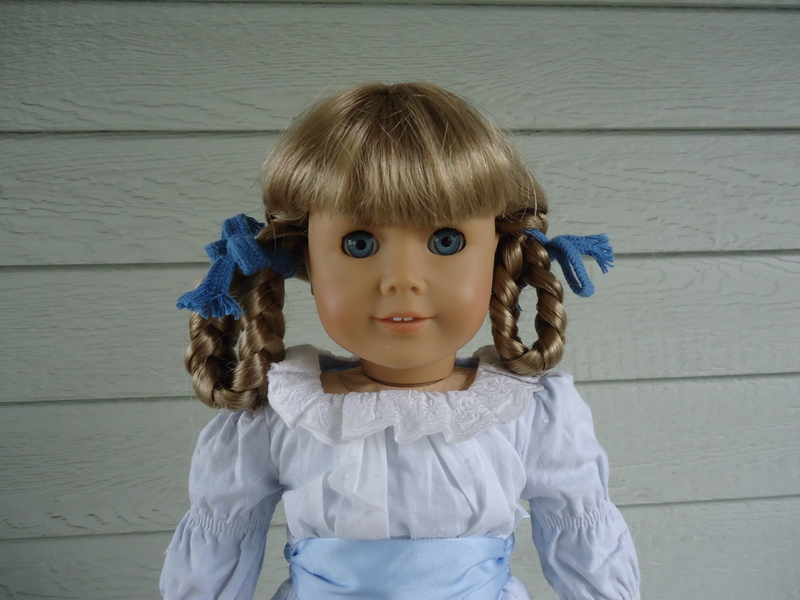 I will follow conventional naming, naming the molds after the first doll that had them. 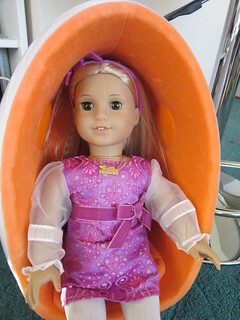 First, the classic mold. 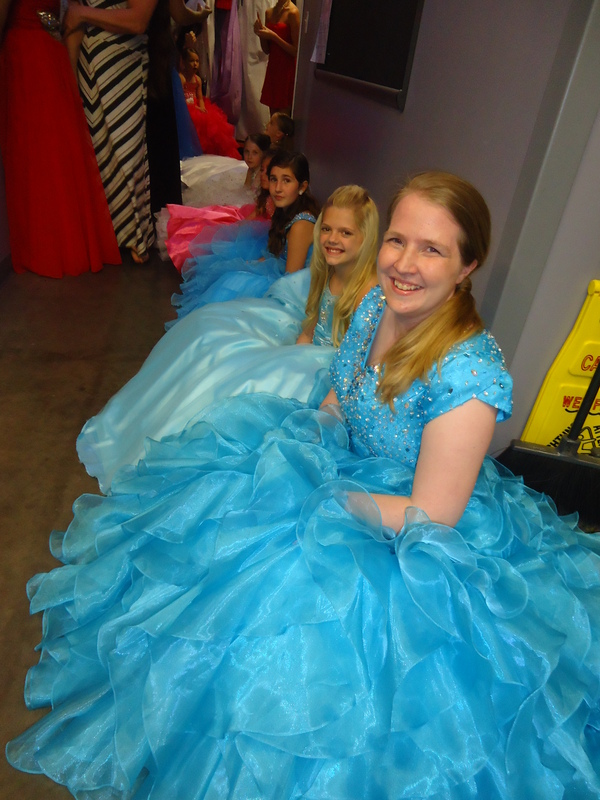 Pictured here on Kirsten, Felicity, Kit, Lindsey, Kailey, Emily, Nicki, Mia, Ruthie, Lanie, Caroline, and Saige. 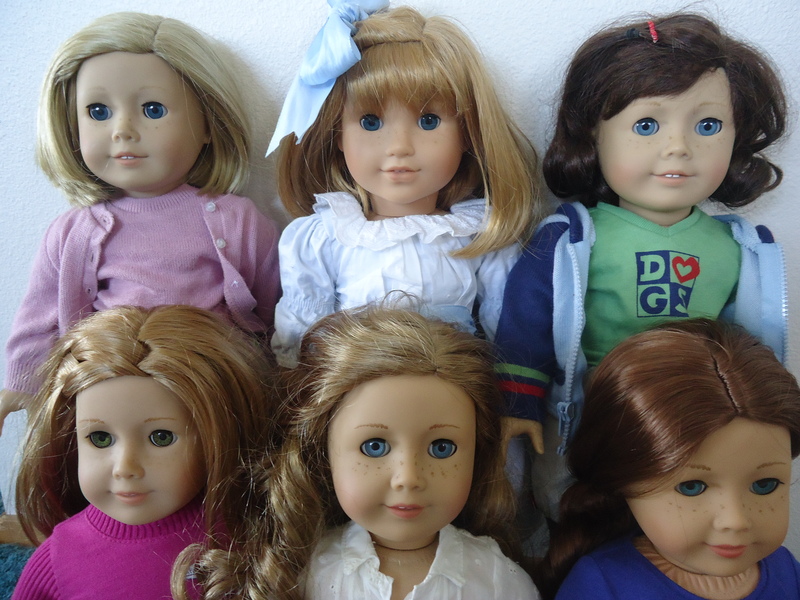 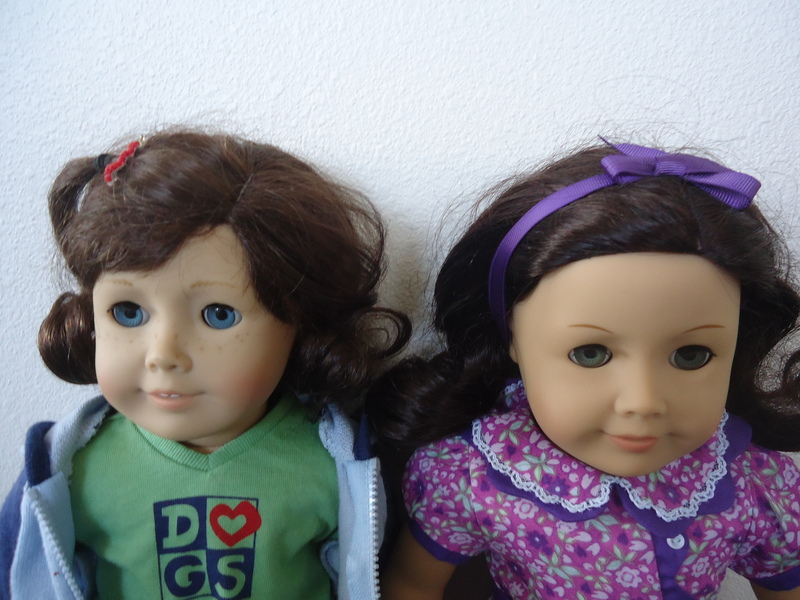 I left Samantha and Molly out of this picture because my Samantha and Molly were made before the Mattel takeover, and I think they look different. 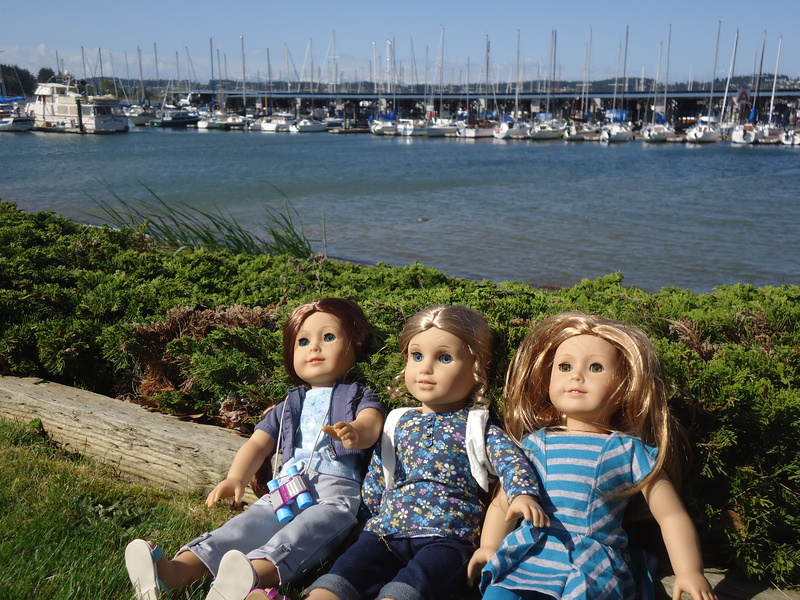 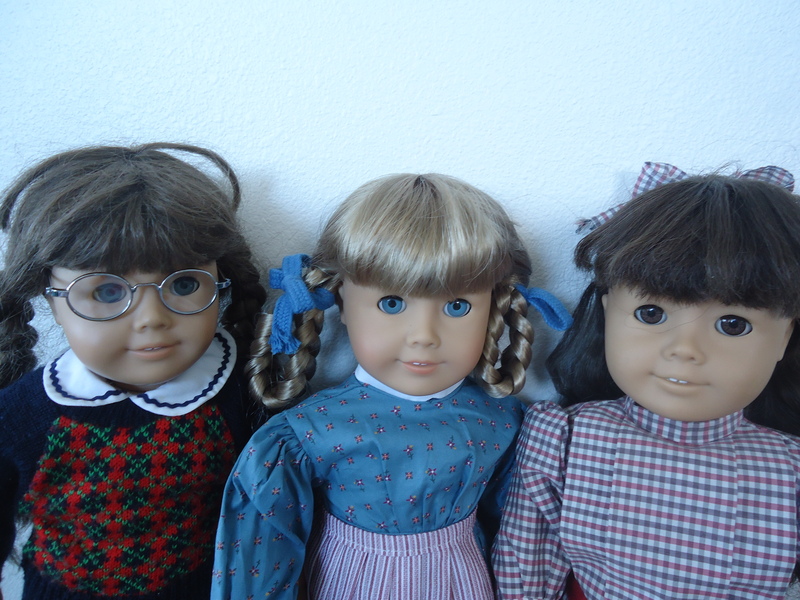 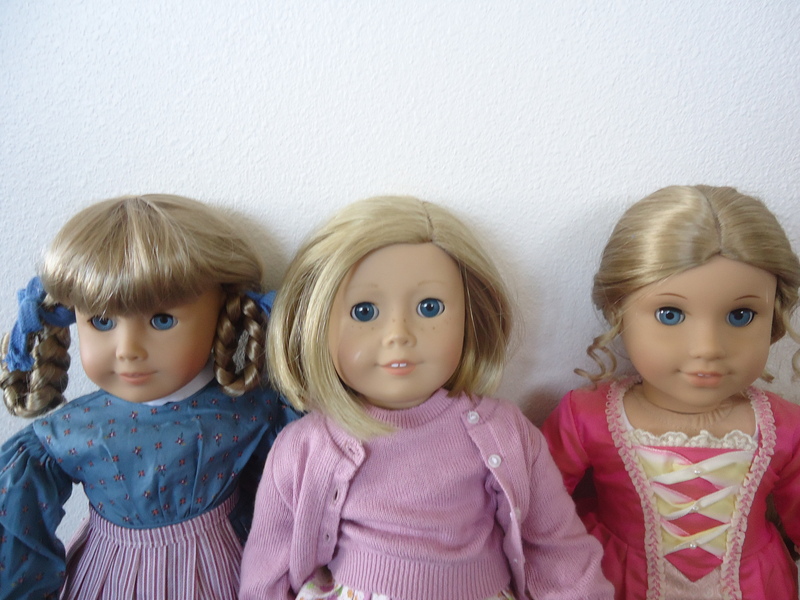 Here are the first three American Girls: a pre-Mattel Molly, a Mattel Kirsten, and a pre-Mattel Samantha. 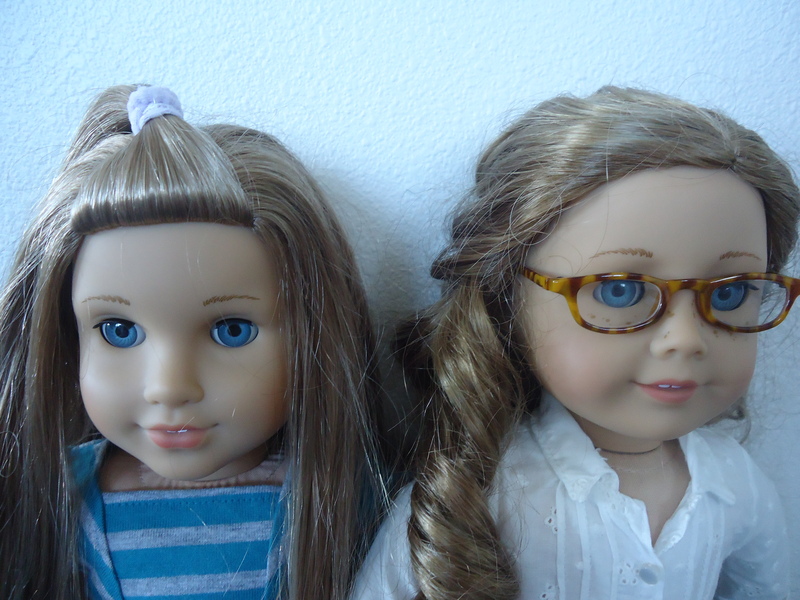 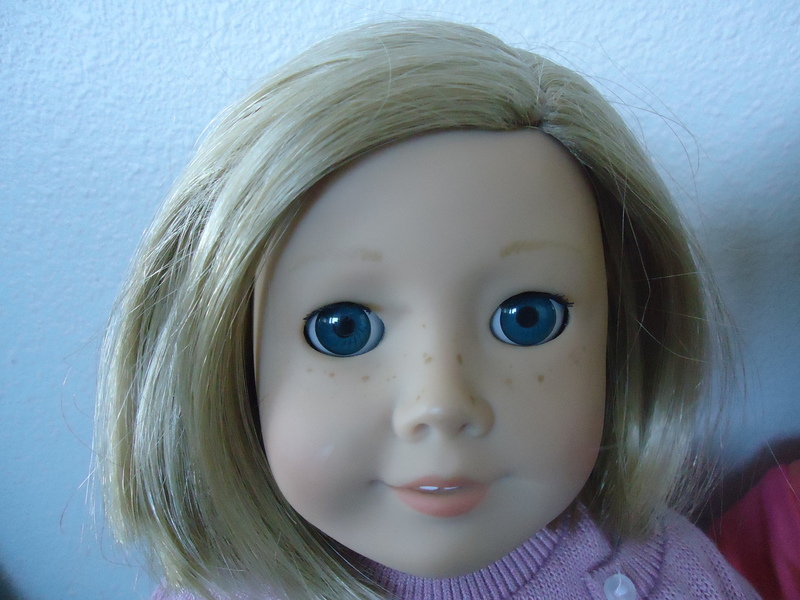 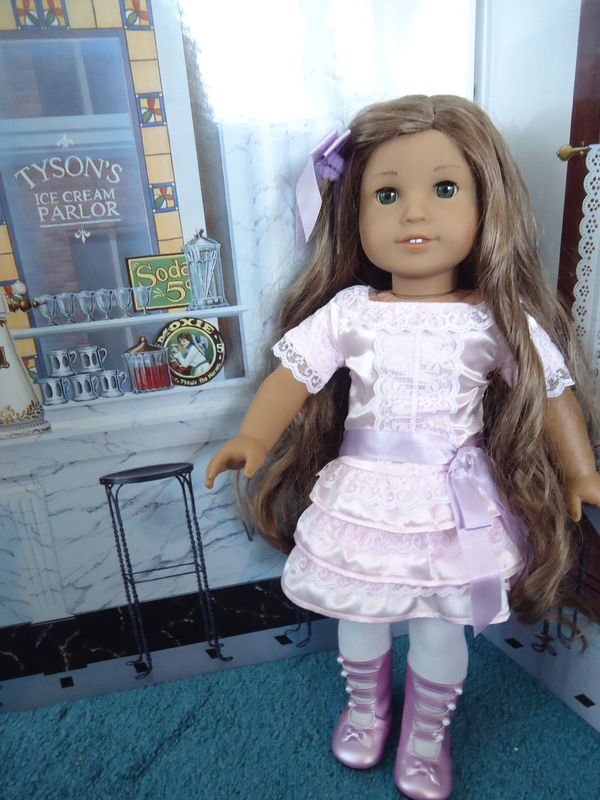 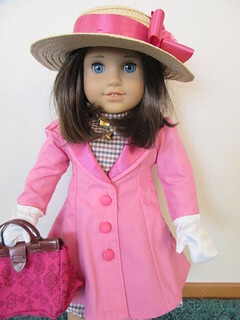 Felicity was the next doll released, and she shared the classic face mold. 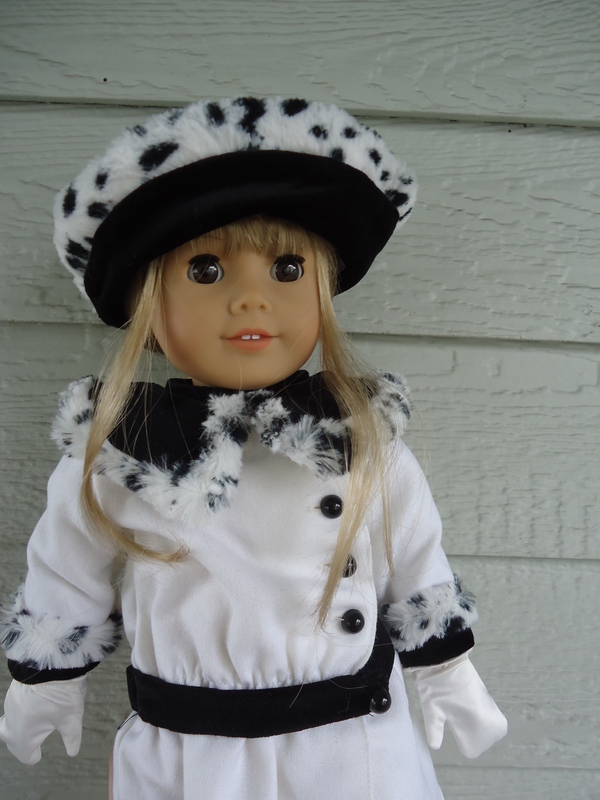 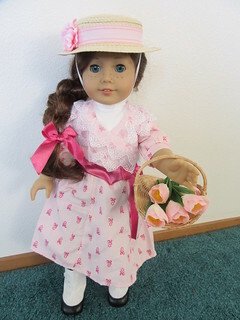 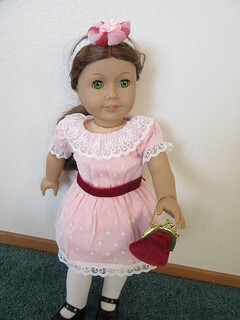 The next doll is Addy, who was released in the mid-90’s (after I got my first catalog, but before I picked my first doll). 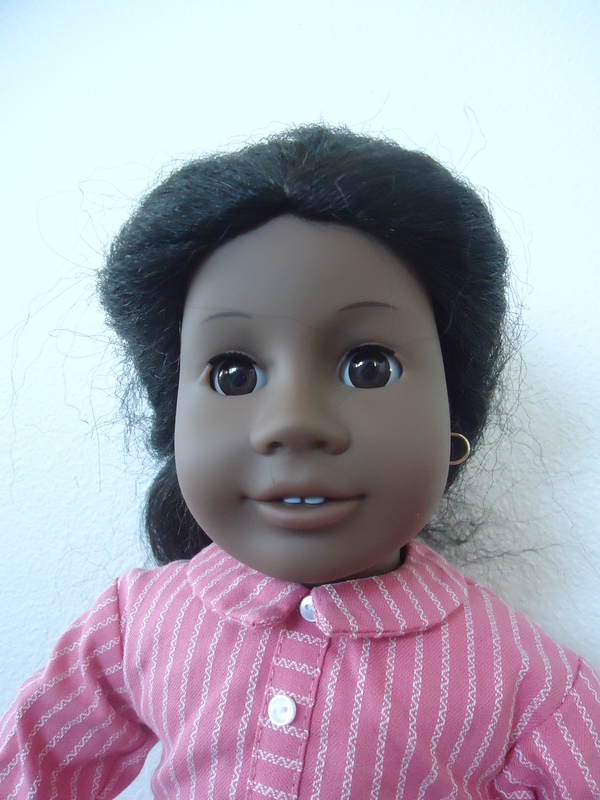 Addy is African-American, and thankfully she gets a new face mold. 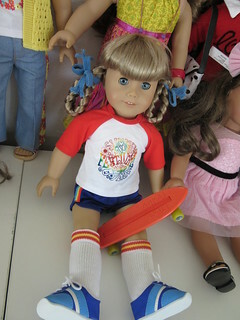 A few years later, but still before the Mattel takeover, we get Josefina. 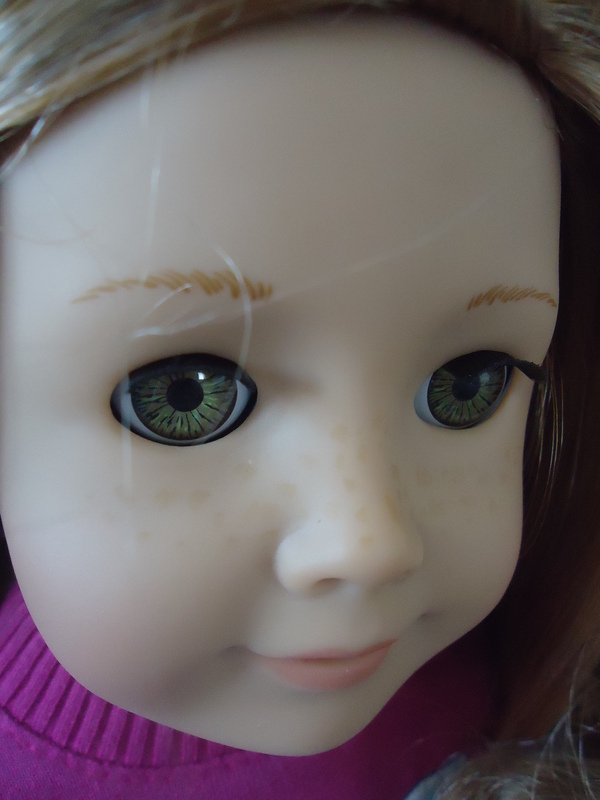 She gets her own face mold, and since then many dolls have shared it. 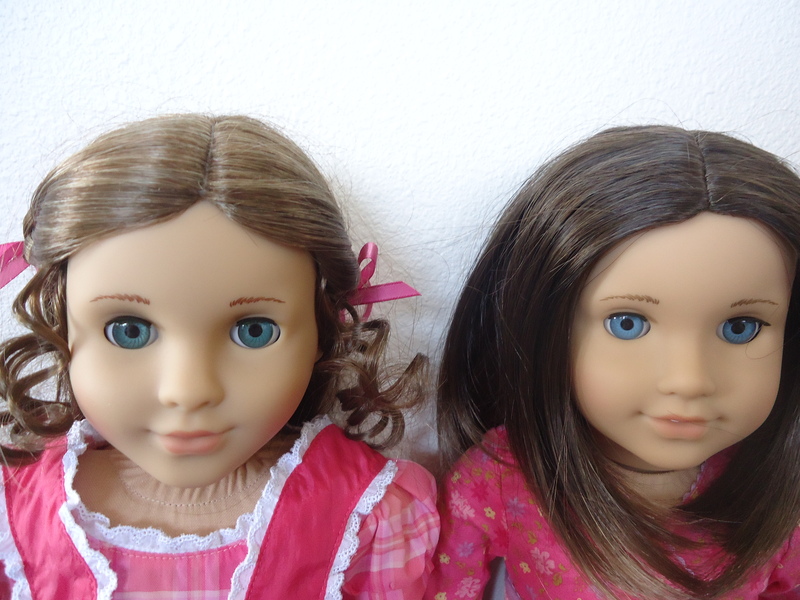 Some argue that it’s more popular than the classic mold (Chrissa and McKenna both sold very well), but I like the classic mold better. 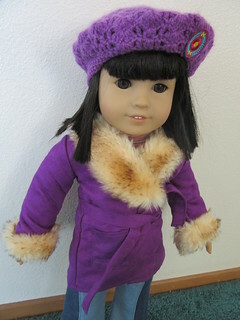 In 2006, we meet Jess, who is half-Japanese. 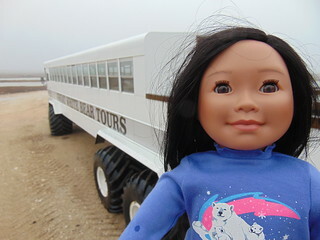 While at this point there was an Asian Girl of Today, Jess got her own mold. 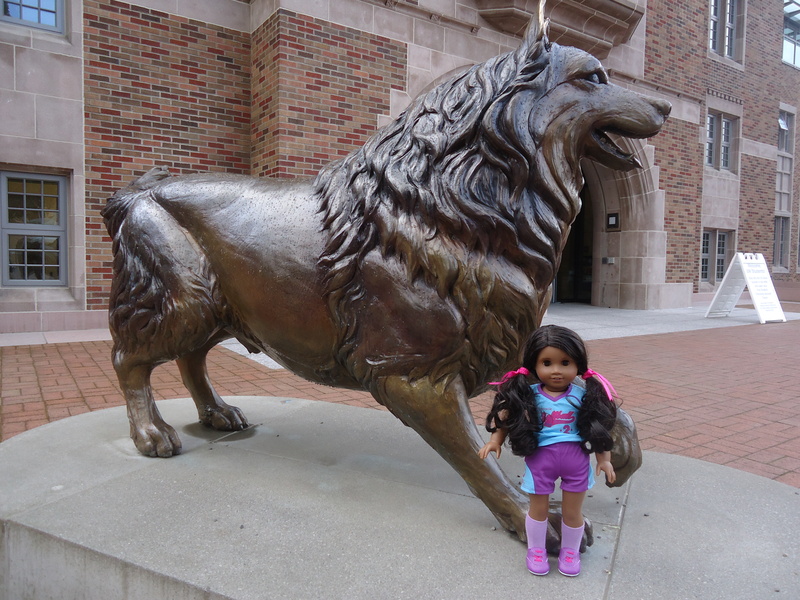 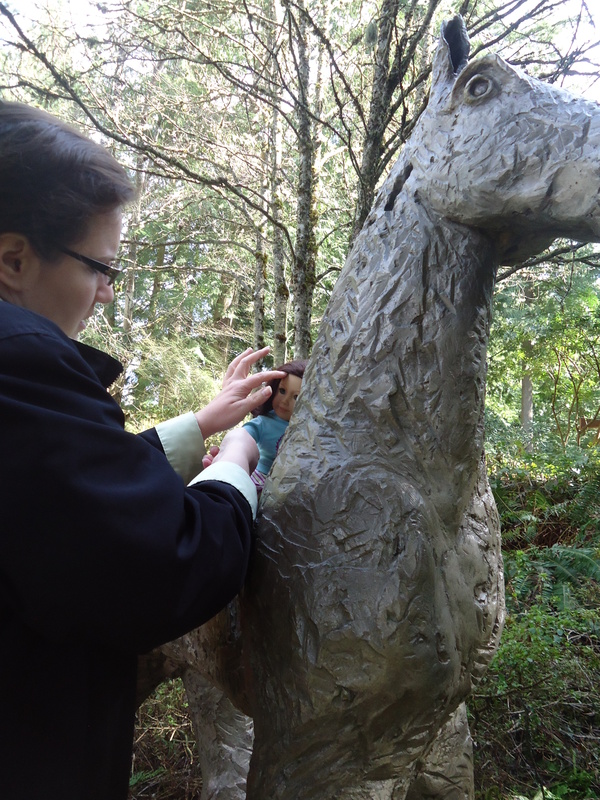 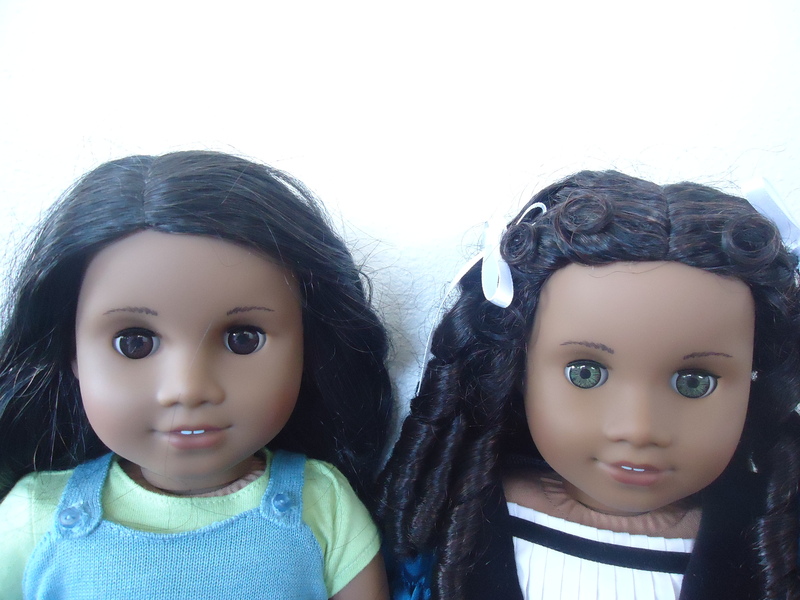 The same mold is used for Ivy and Kanani. 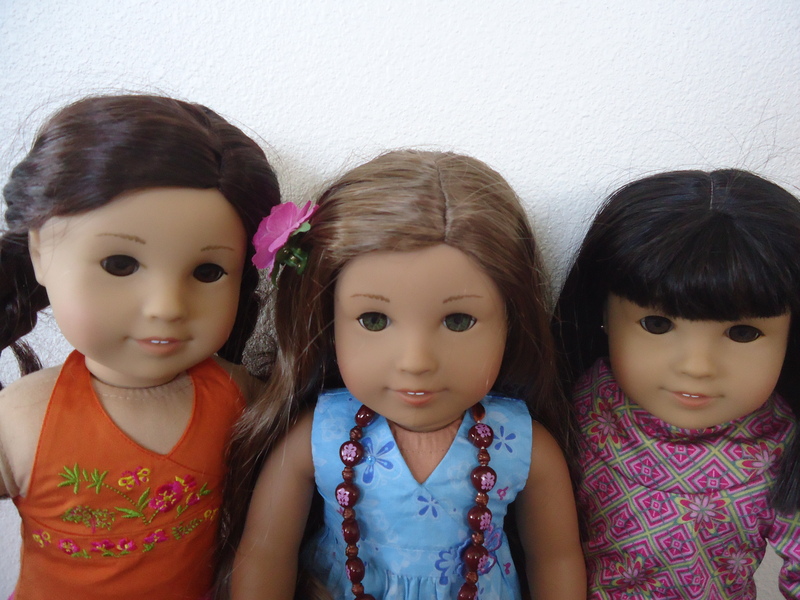 Even though these three dolls have the same face, there’s no denying how different they look from each other. 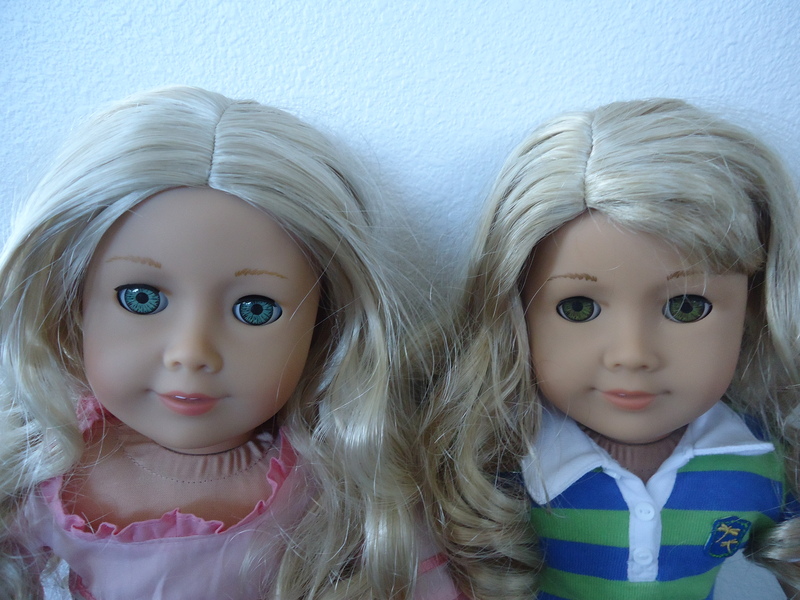 In fact, for years I thought Jess and Ivy had different faces because Jess’s eyes looked more round than Ivy’s. 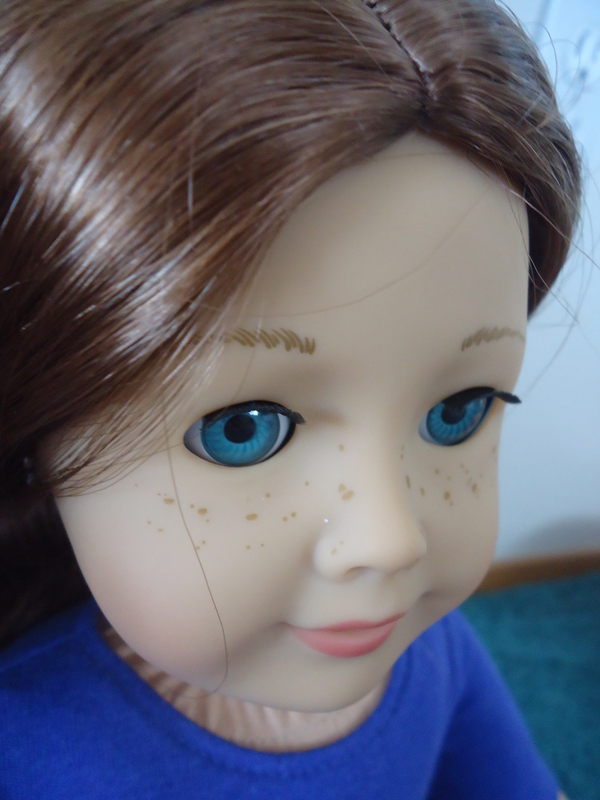 As it turns out, Ivy’s face is painted to make her eyes look pointier. 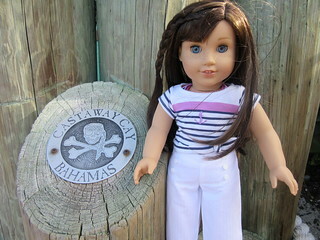 Kaya gets her own face mold. 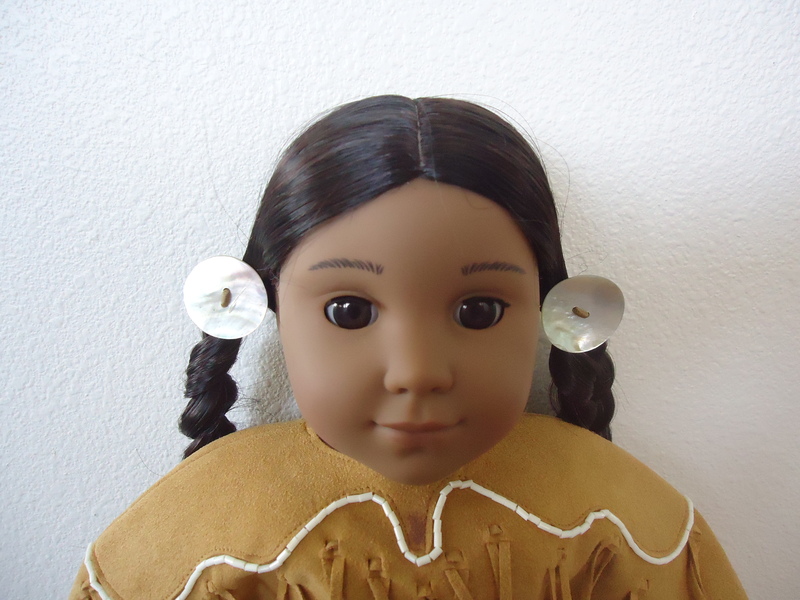 She is the only doll who doesn’t show her teeth, because showing teeth is rude in Nez Perce culture. 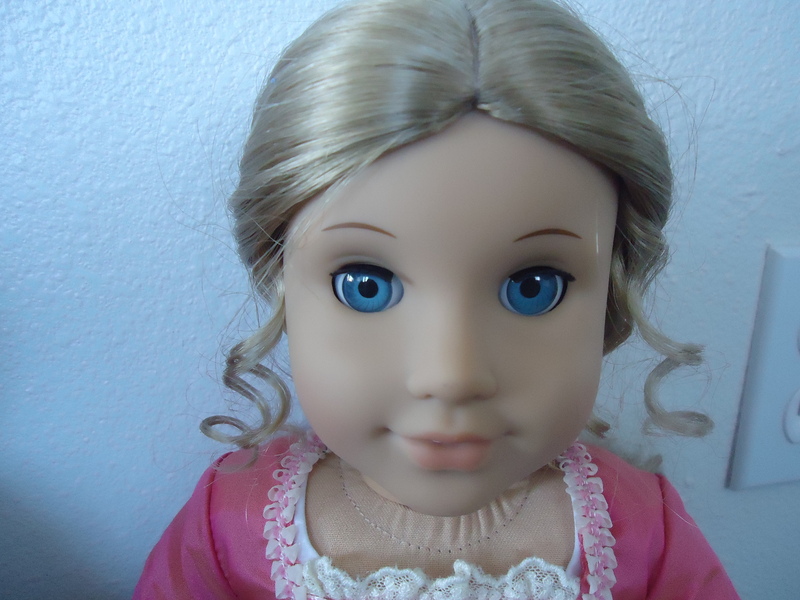 And finally, Marie-Grace has her own face mold. 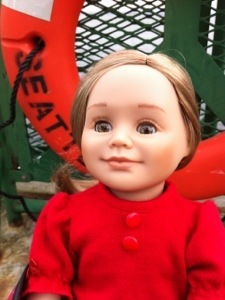 Marie-Grace has a pointier chin than Chrissa and fuller lips than Ruthie. 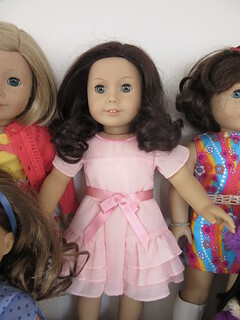 A beautiful rainbow, from strawberry to auburn. 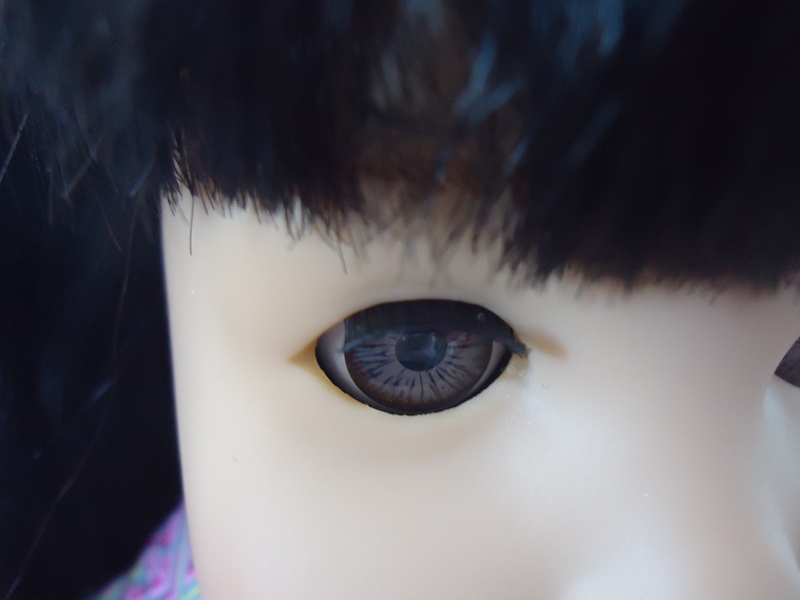 Let’s get closer. 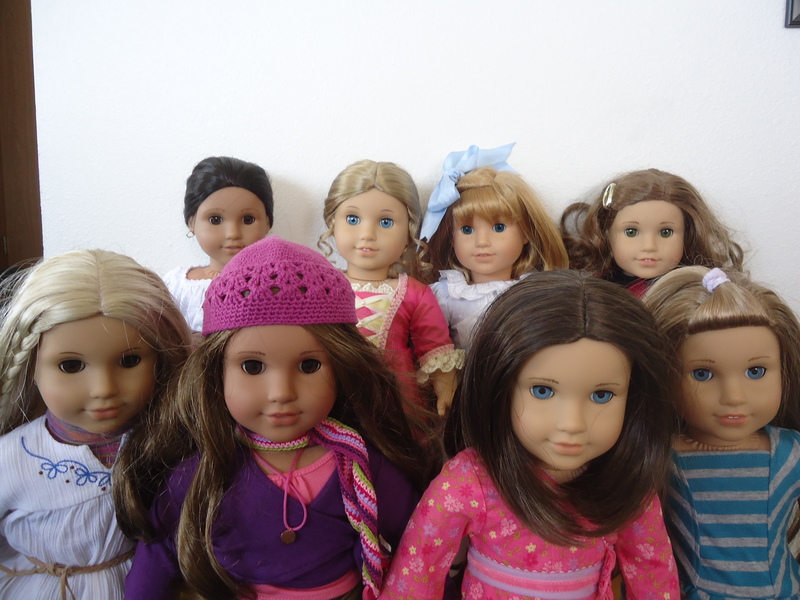 There’s so much variation in each of these wigs, that I wonder if you’ll even find differences among each Saige doll, each Felicity, etc. 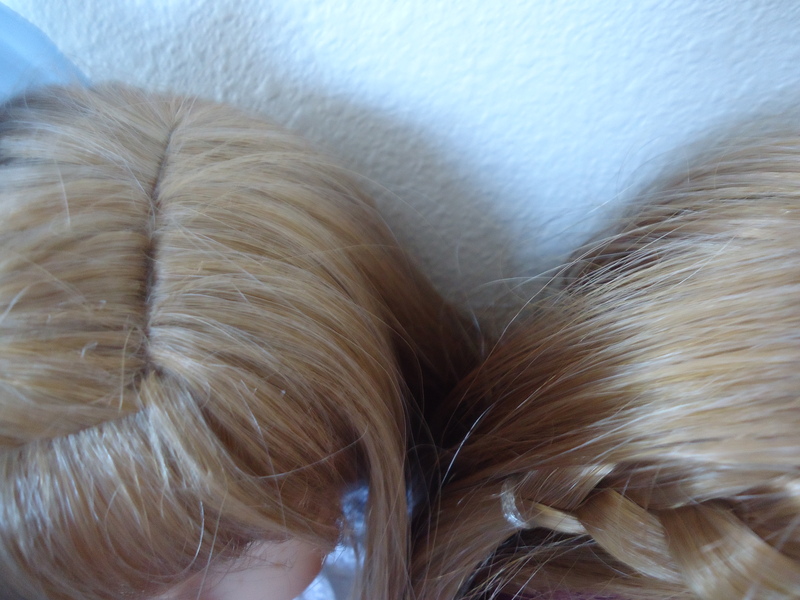 Each wig has multiple hues, and that’s what I love most about these redheaded dollies. 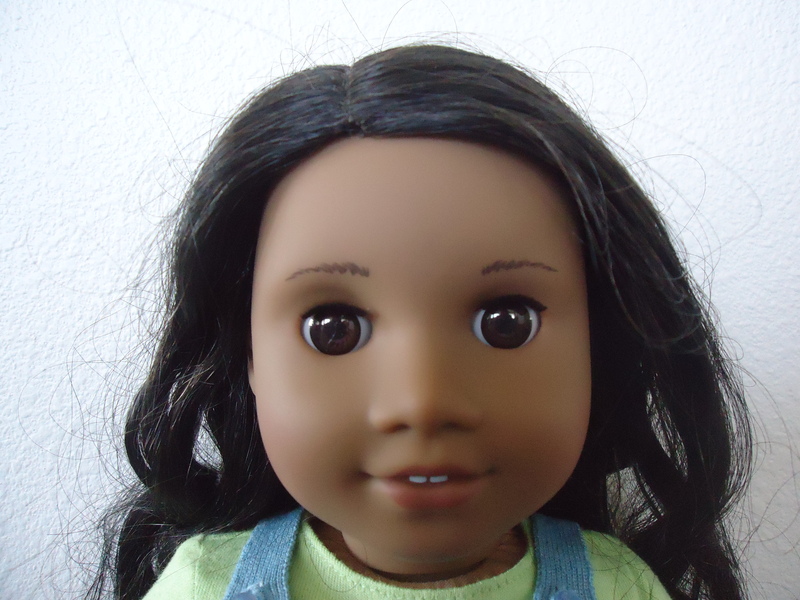 We’ve covered blondes and redheads, how about caramel? 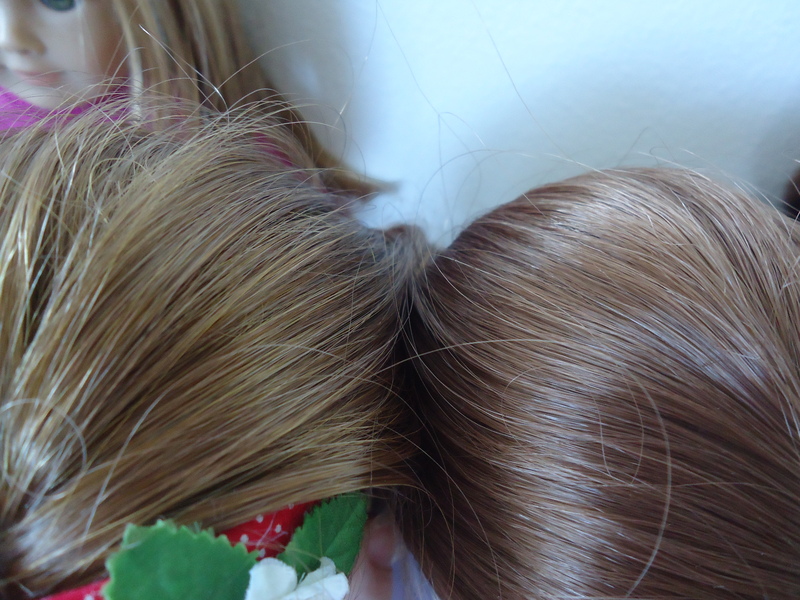 What is caramel-colored hair? 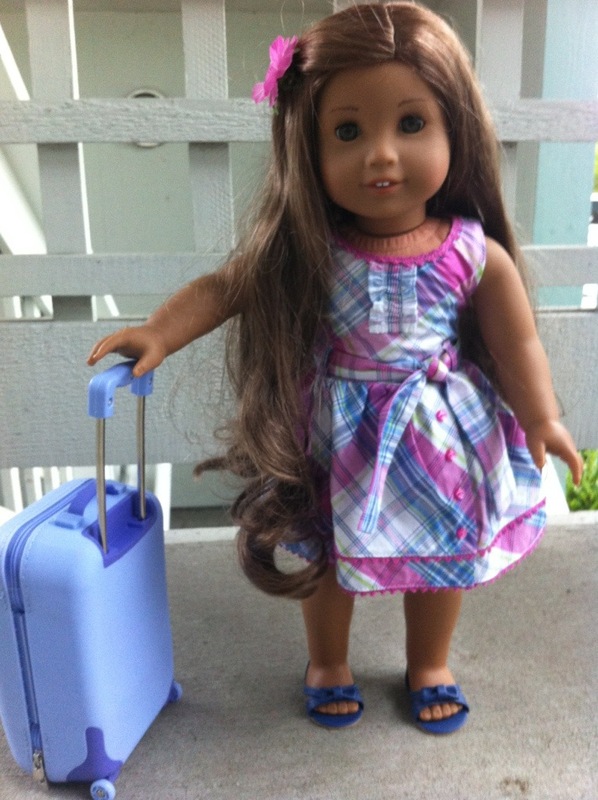 I’d never heard hair color described as caramel until American Girl, but here it is. 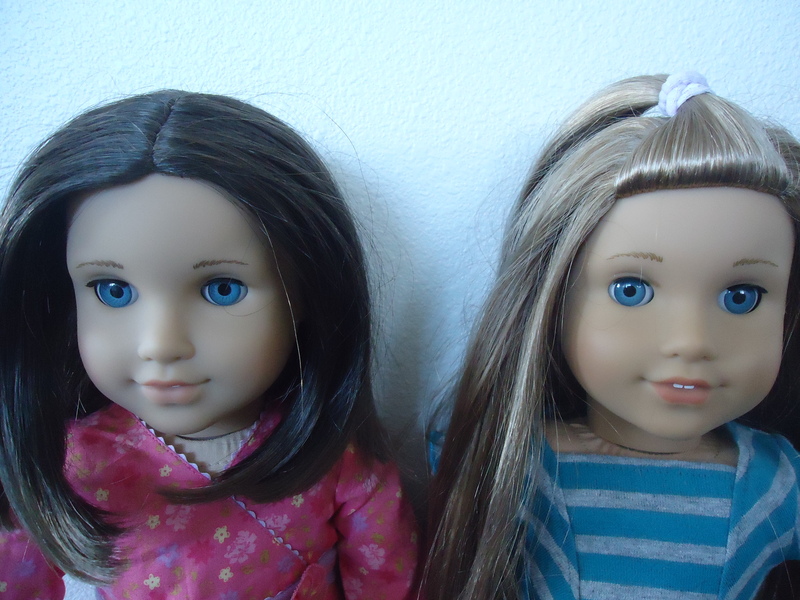 Nicki and McKenna have caramel-colored hair. 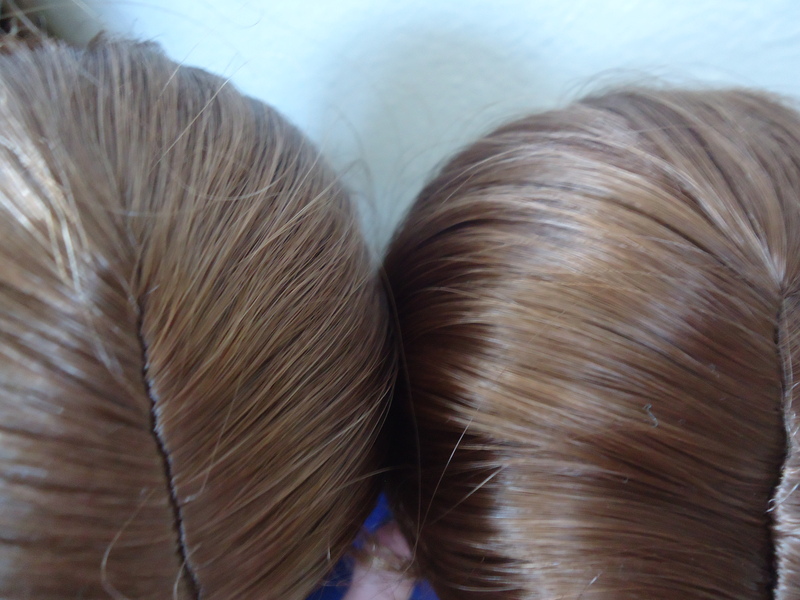 It’s not red, it’s not blond, it’s not brown. 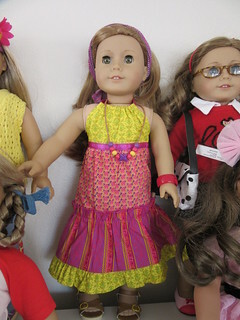 Let’s finish off with some buddy shots of dolls that are similar, but different. 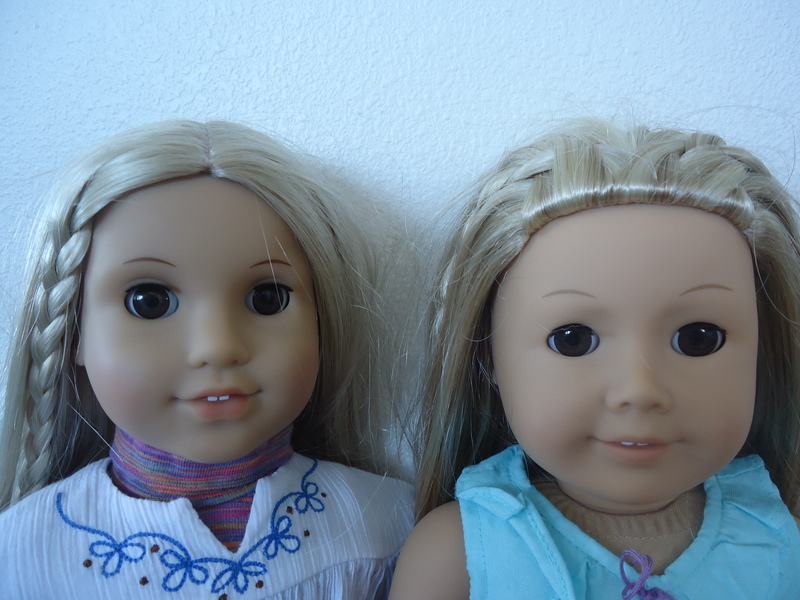 Caroline and Lanie. 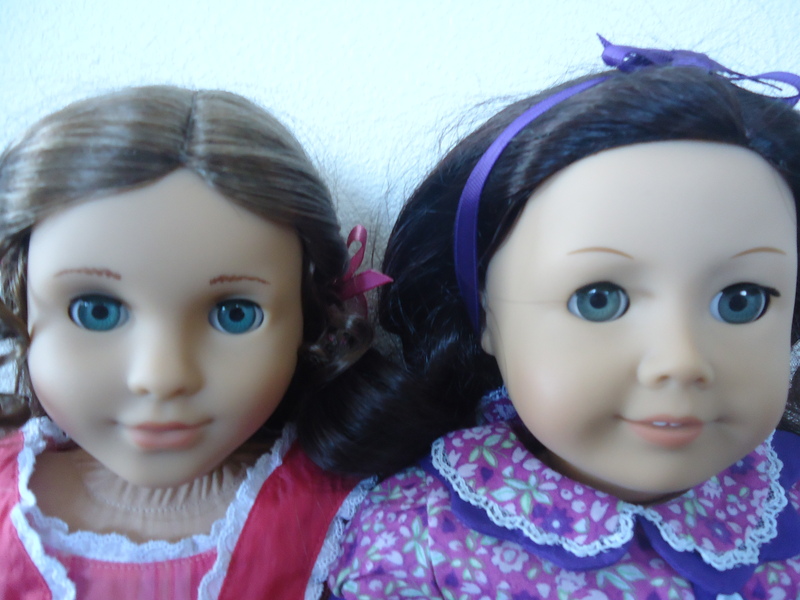 Both have curly blond hair and green eyes, but Caroline’s eyes and hair are both much lighter. 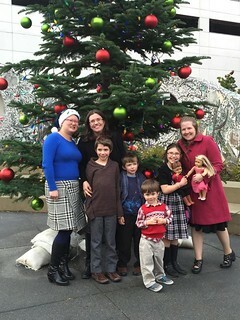 Of my 30, I think Chrissa and McKenna are the most similar looking. 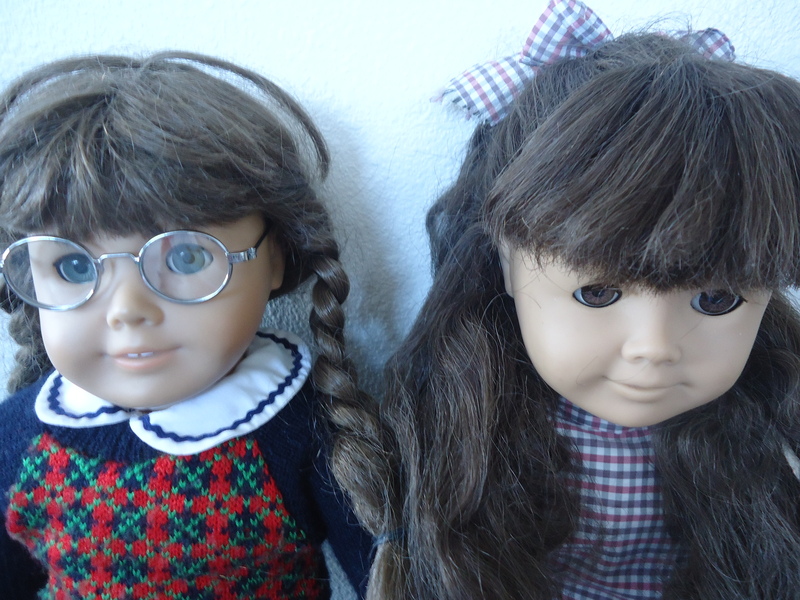 They both have blue eyes on a Josefina face mold, with straight hair and no bangs. 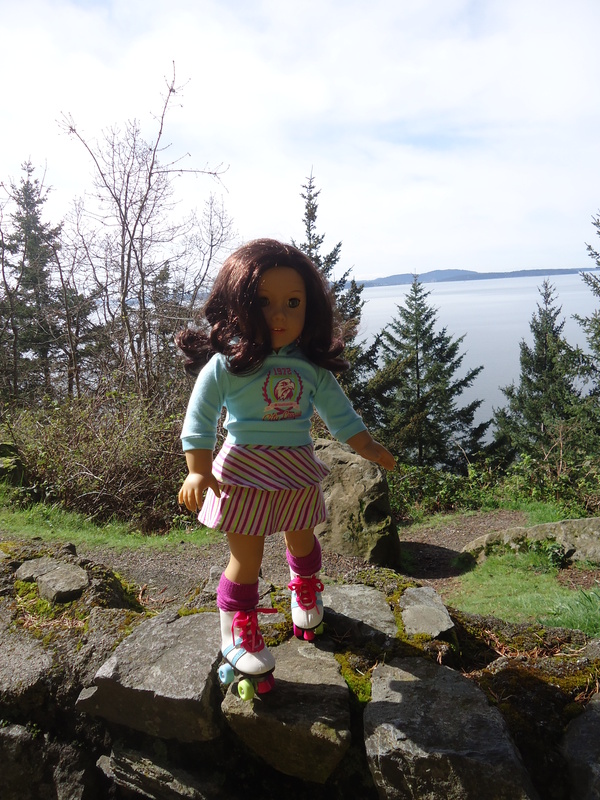 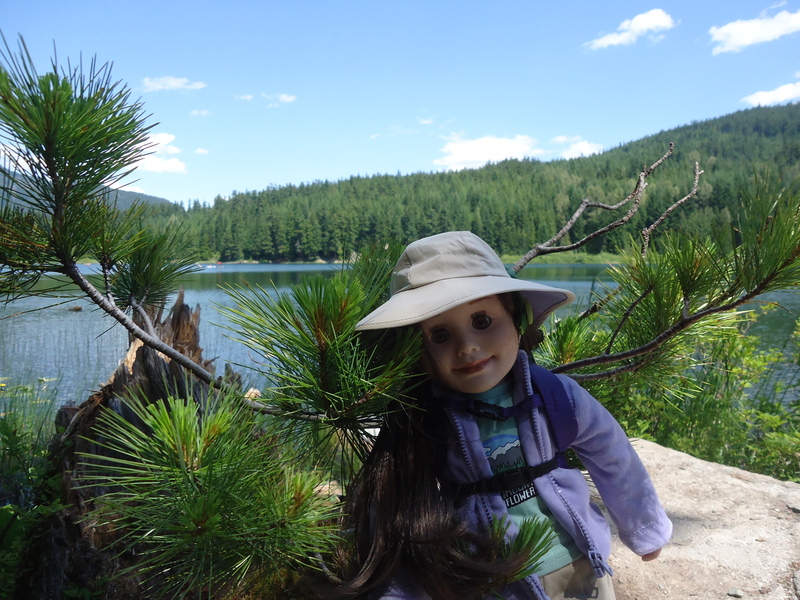 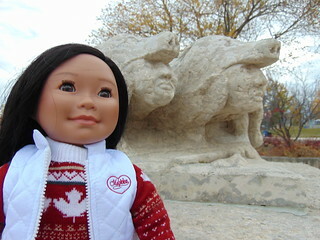 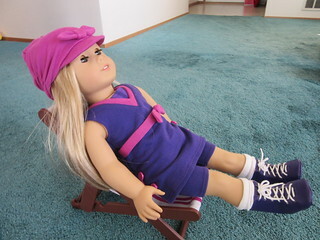 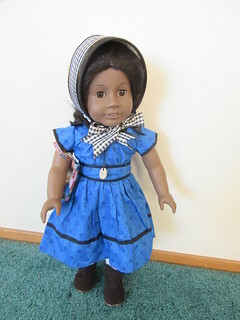 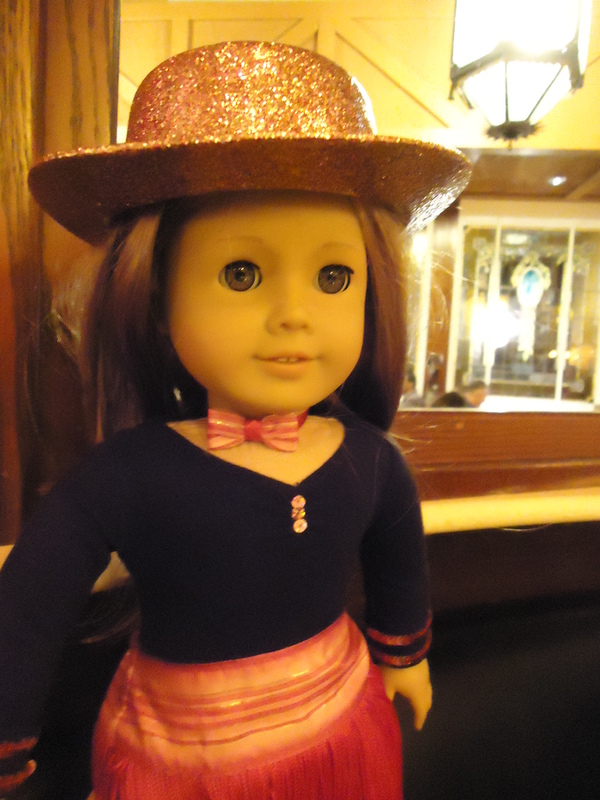 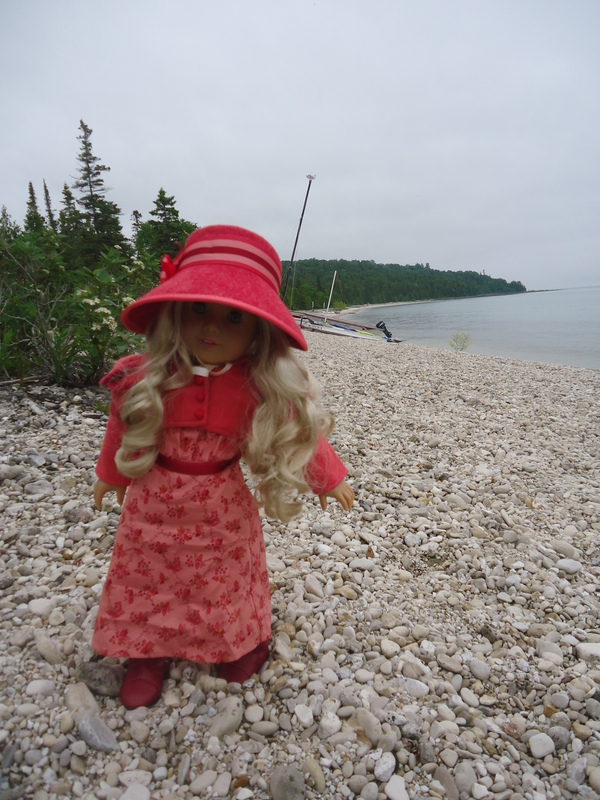 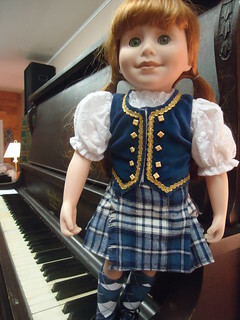 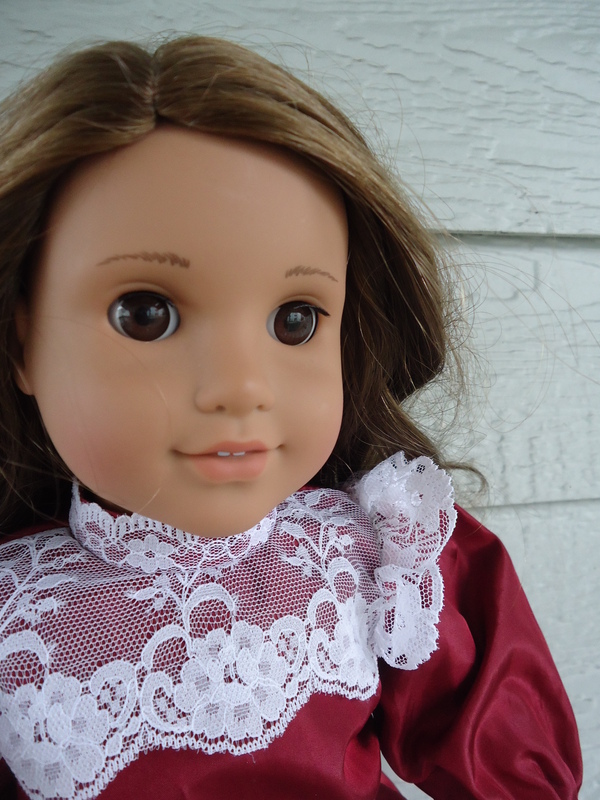 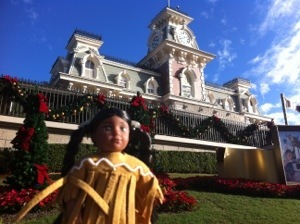 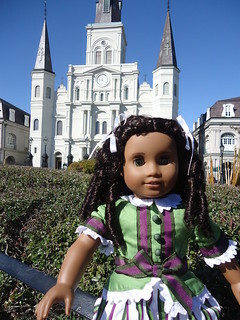 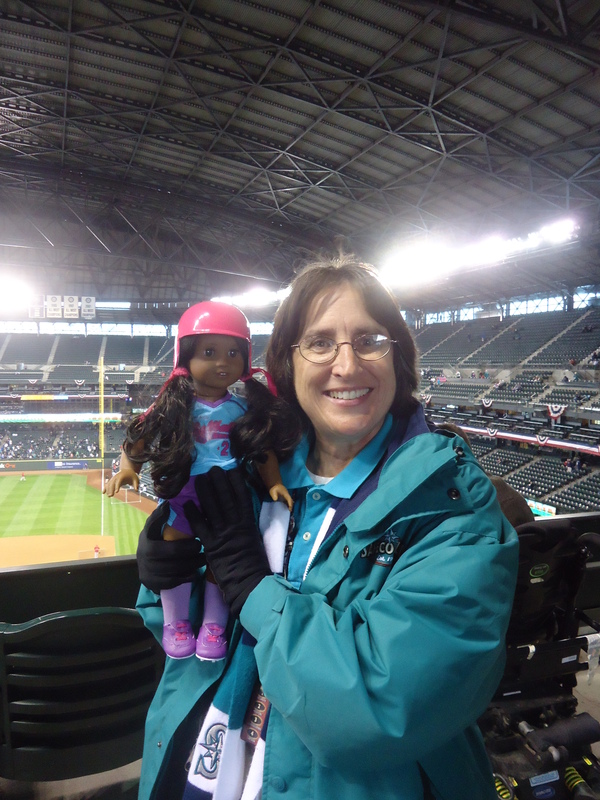 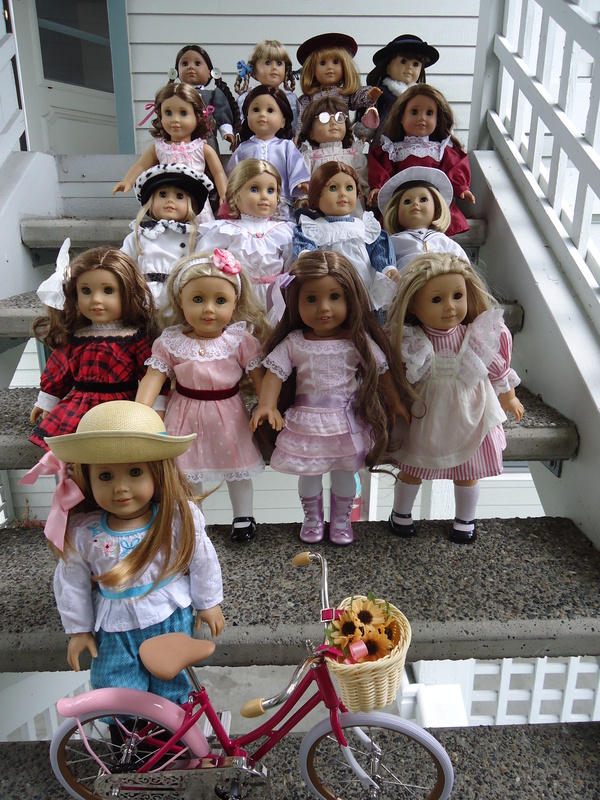 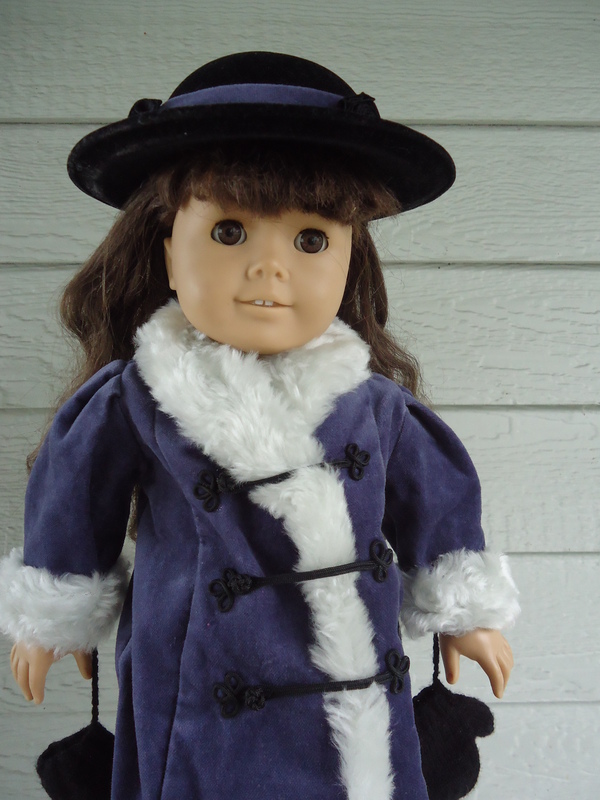 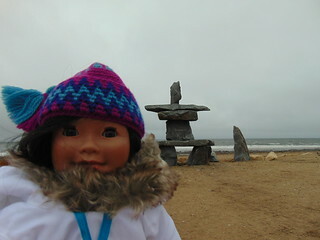 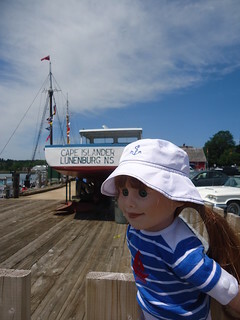 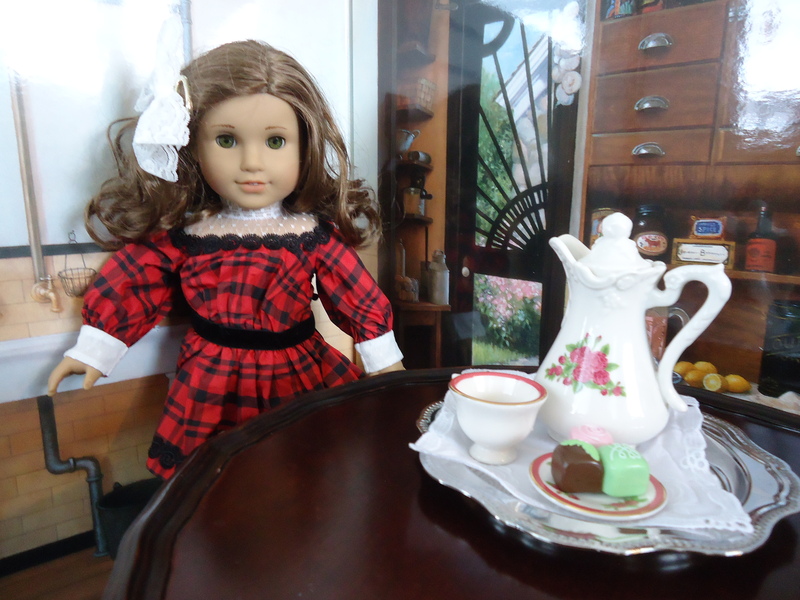 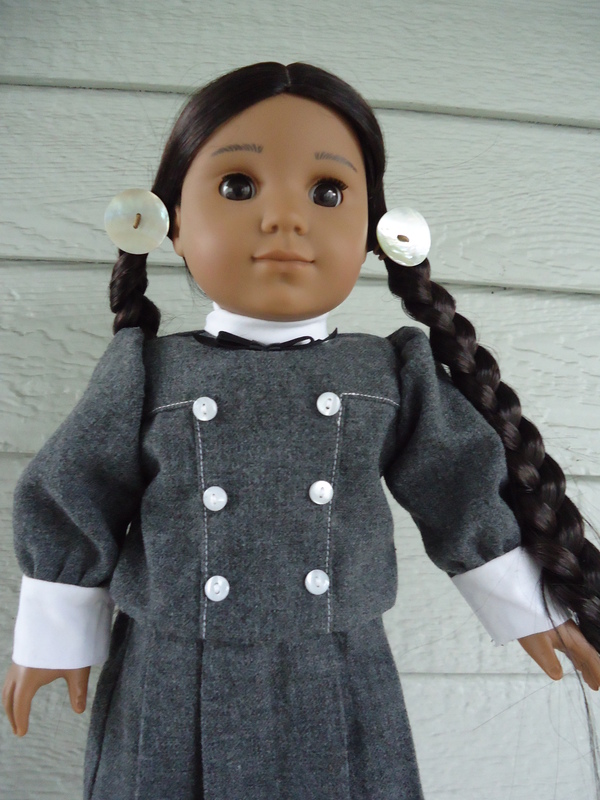 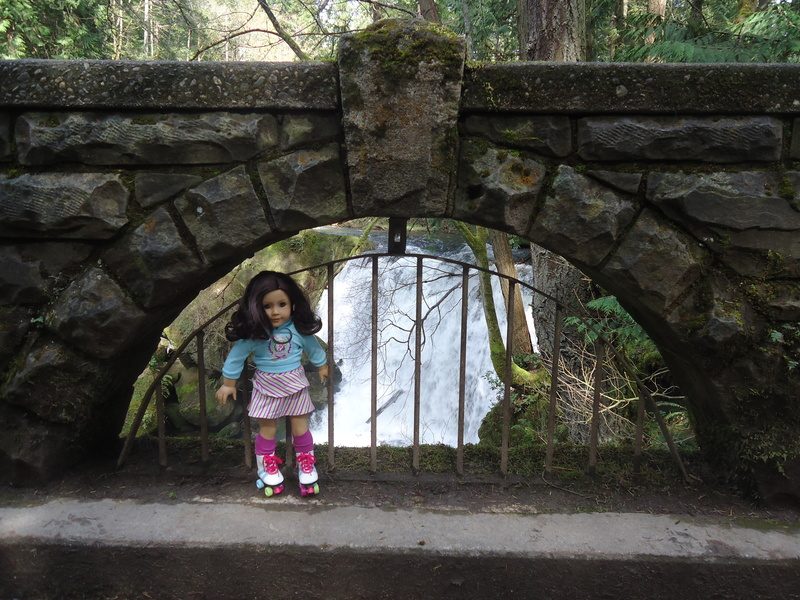 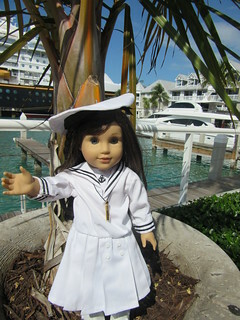 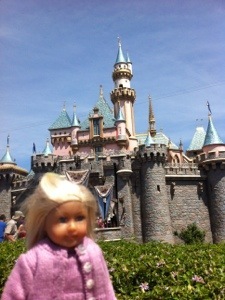 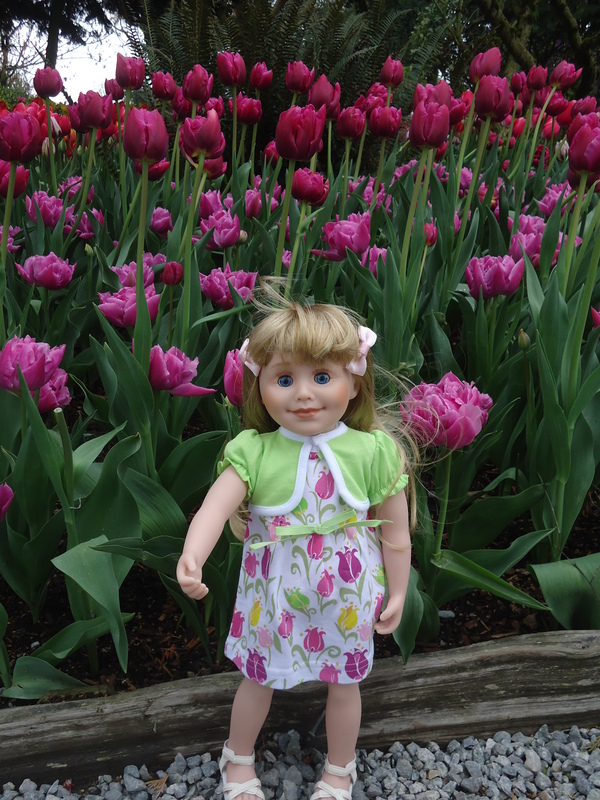 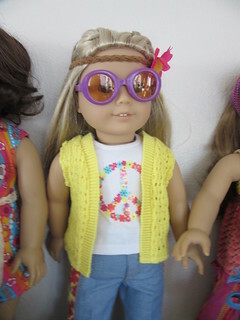 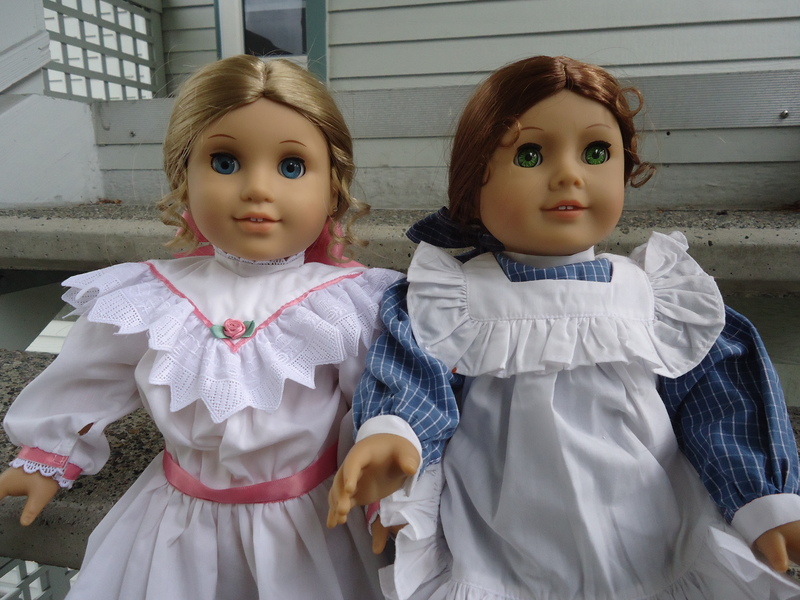 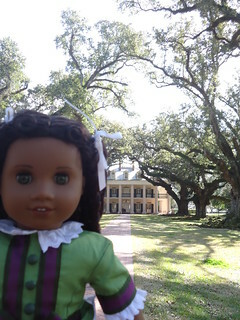 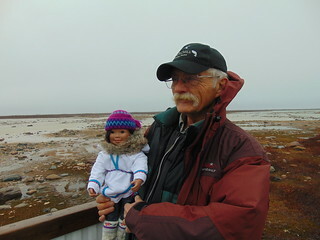 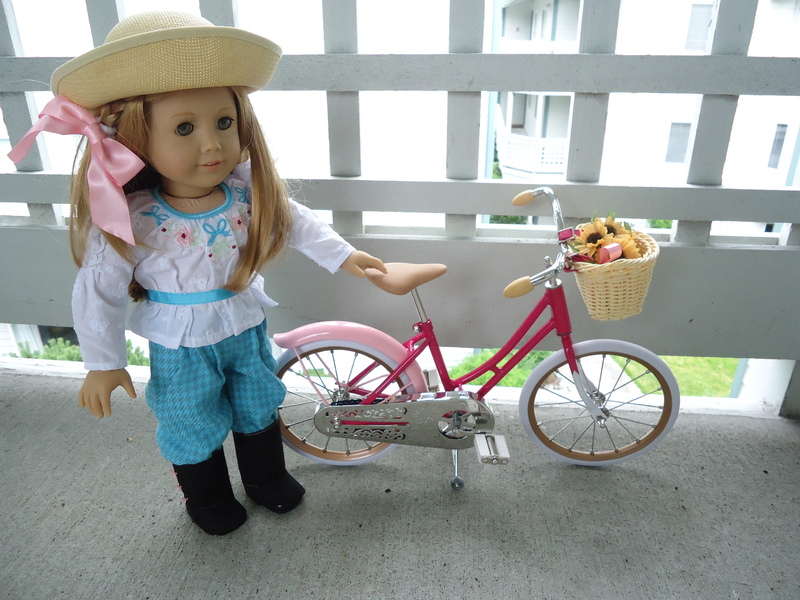 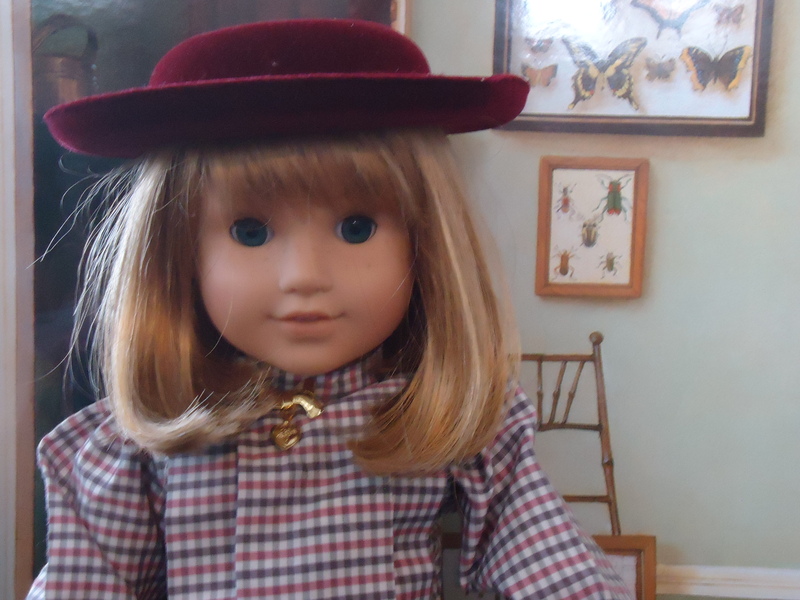 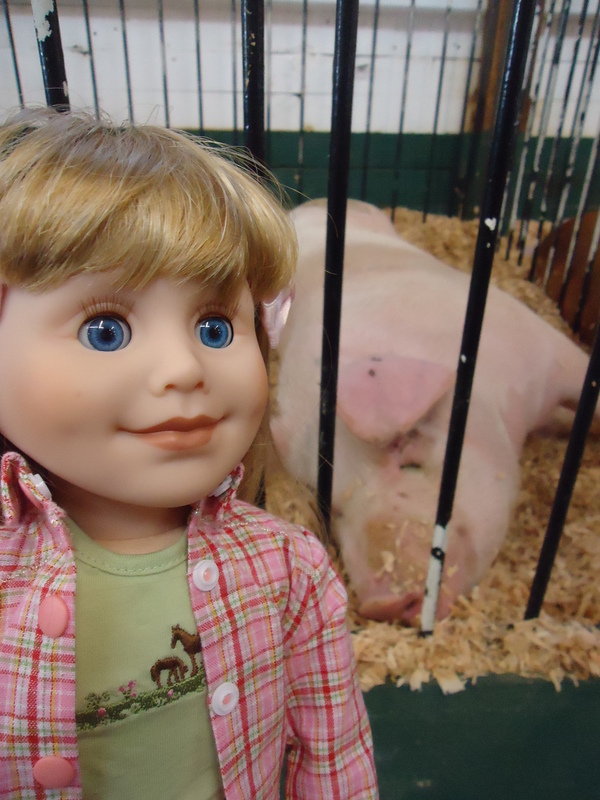 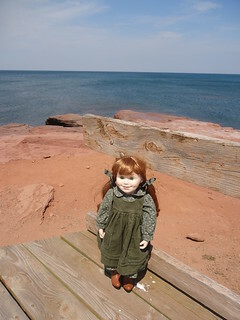 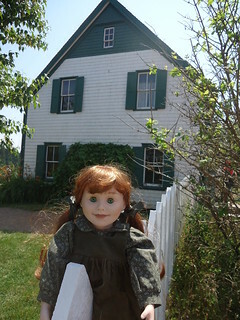 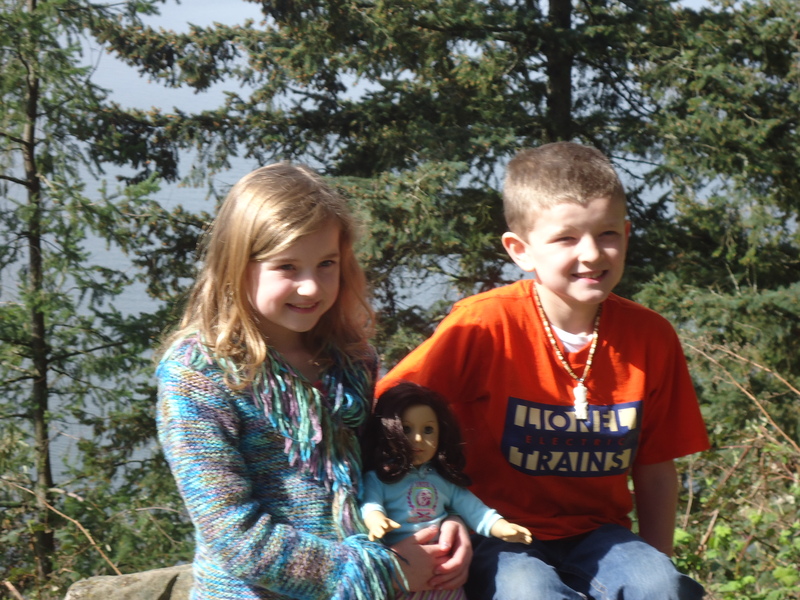 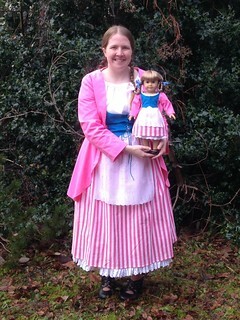 I hope you’ve enjoyed exploring the similarities and differences among my American Girl dolls. 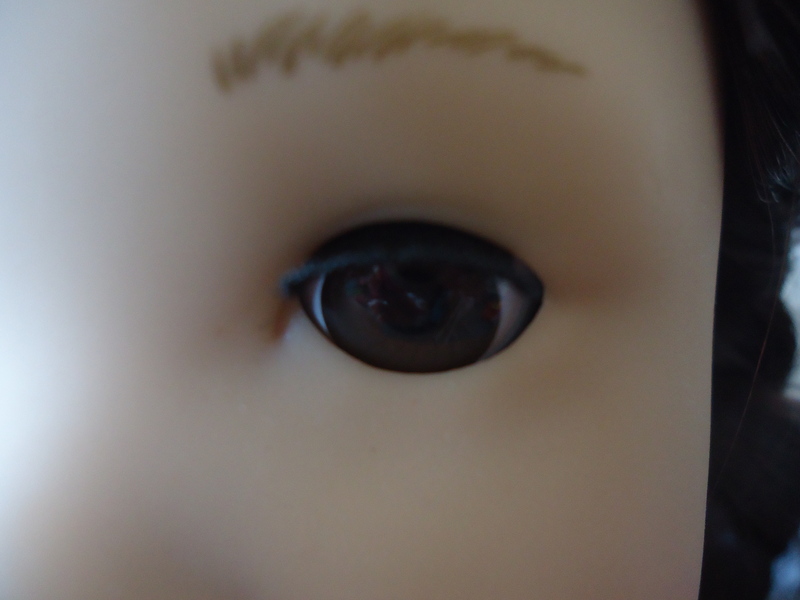 I wish the photos had more consistent lighting (I took them all today, indoors, with no artificial lighting. 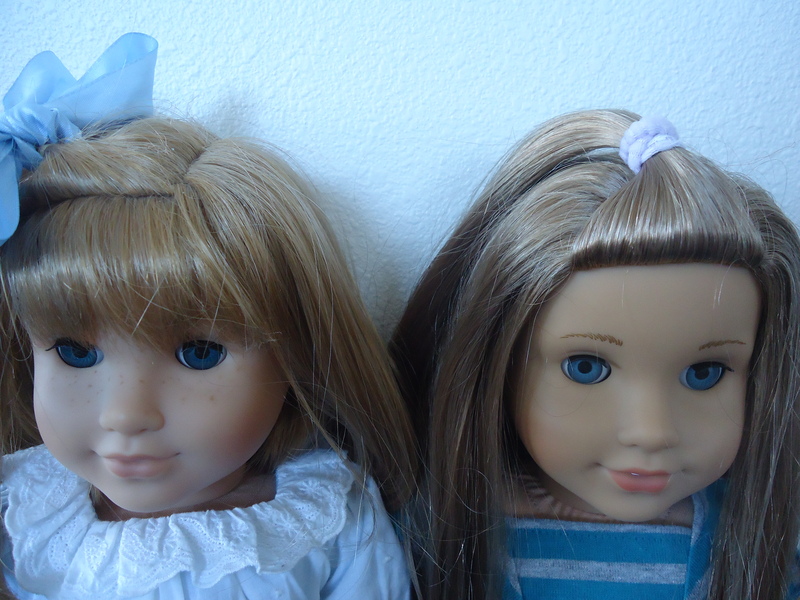 All color correction was done automatically by the camera. 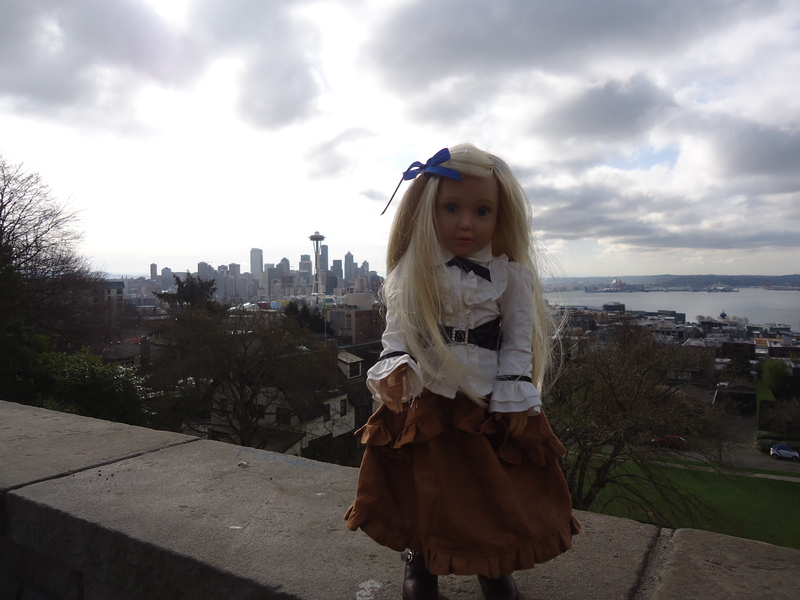 I did no editing.) 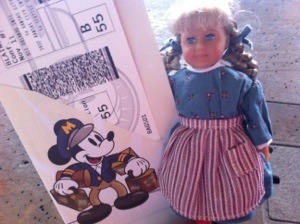 so that the details were more clear. 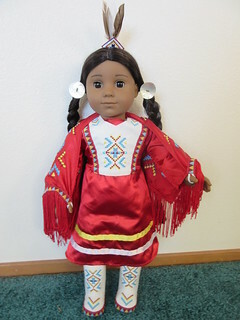 As of right now, I have decided I will stop collecting when they come out with a doll that looks like one I already have. 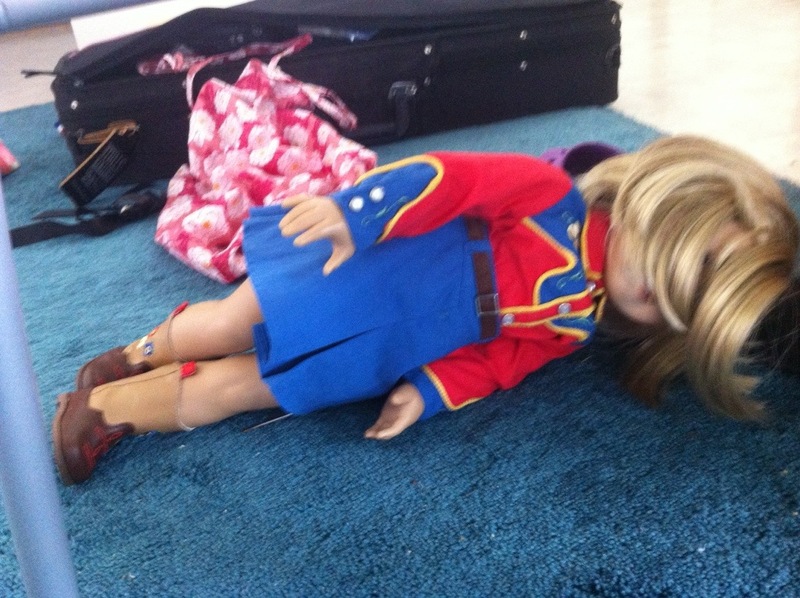 But as you can see, that probably won’t happen soon. 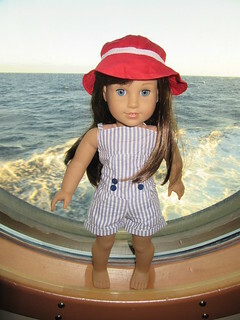 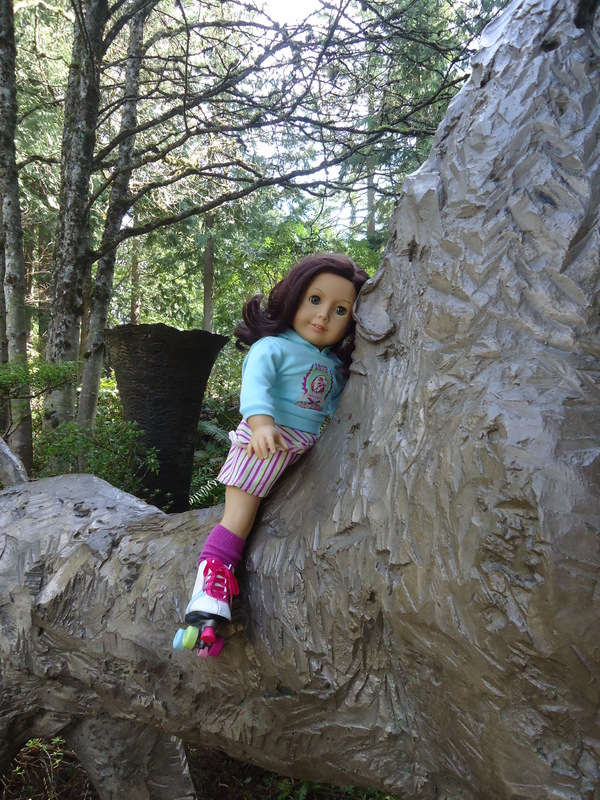 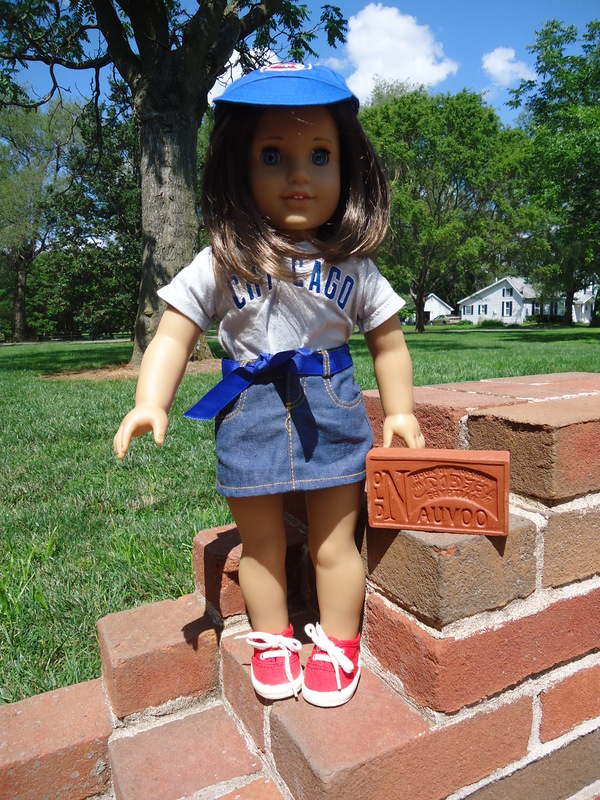 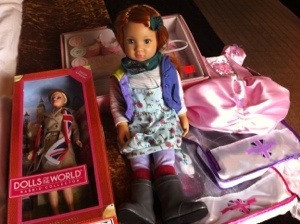 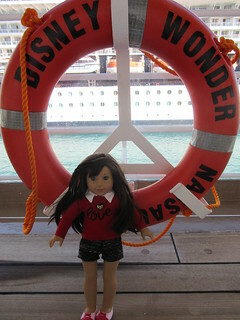 The possibilities for American Girl appear to be endless!